NOT AT ALL BORING FOR AAL! AAL MAKES HASTE TO DELIVER MEGA TUNNEL BORING MACHINES (TBMs) FOR GEODIS AND MAJOR AUSTRALIAN RAIL INFRASTRUCTURE PROJECTS! In February, AAL successfully completed a major shipment of two mega tunnel boring machines (TBMs) from Nansha in South China to Sydney and Melbourne respectively, equipment that will help progress important new multi-billion-dollar metro railway projects taking place separately in the two state capitals. 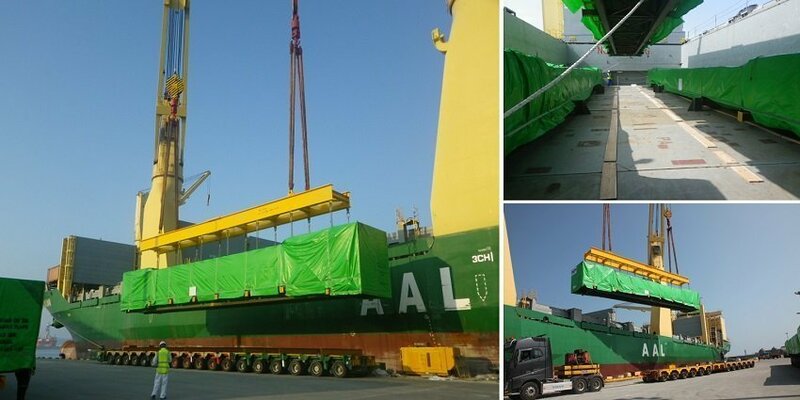 The two units and their components totaled over 7,445cbm and 2,000mt in weight and were shipped aboard the 31,000dwt heavy-lift MPV, the AAL Kembla, on behalf of Geodis Hamburg. AAL PUSAN IN ‘A-CLASS’ OF HER OWN! 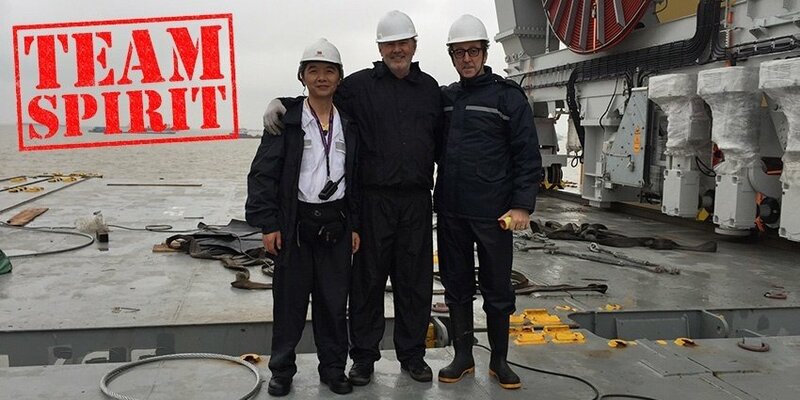 AAL MEGA-SIZE MPV DELIVERS 22 CHINESE PETROCHEMICAL PLANT MODULES TO MAJOR EXPANSION PROJECT IN TEXAS IN A SINGLE SAILING! 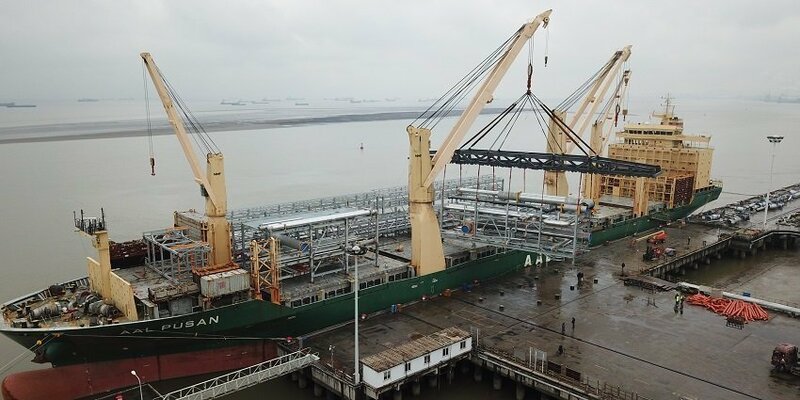 Specialist breakbulk and project heavy lift carrier AAL has successfully shipped 22 petrochemical plant modules from the Wilson Heavy Industry Company in Nantong, to the Ethylene Glycol II Expansion Project in Point Comfort, Texas on behalf of the Pacific Ocean Group Limited. 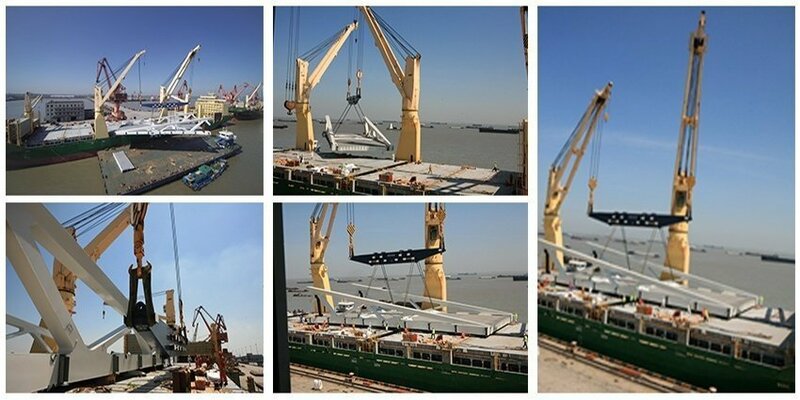 The shipment of 22 modules – 26,000 cbm in total and weighing 1,280 t – was loaded in Nantong and transported on a single sailing to Point Comfort aboard the mega-size MPV, the A-Class 31,000 dwt AAL Pusan. The project made good use of her 700 t max heavy lifting gear in loading and discharge operations, and harnessed over half of her copious intake capacity of 40,000 cbm, with several units stowed away in her holds whilst others were securely lashed onto her weather deck. 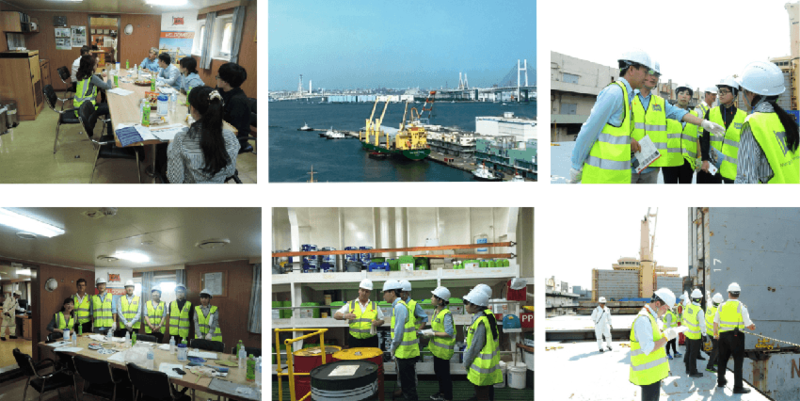 The Ethylene Glycol II Expansion Project is operated by Nan Ya Plastics, a division of the Taiwanese petrochemicals production giant the Formosa Plastics Corporation. Once installed, the modules will aid in the production of Ethylene Glycol – an odorless and colourless organic compound used in the manufacture of automotive antifreeze, hydraulic fluids, printing inks, and paint solvents. It is also used as a reagent in the making of polyesters, resins, and synthetic waxes. AAL is the official sponsor of the ‘Project Logistics Provider of the Year’ category at the inaugural Heavy Lift Awards, organised by HLPFI. “AAL has been a close partner of HLPFI for many years and their understanding and appreciation of our sector has always been unwavering. We operate in a high pressure service environment, where no two companies, or the quality of their services, are the same and it is people who make the difference. 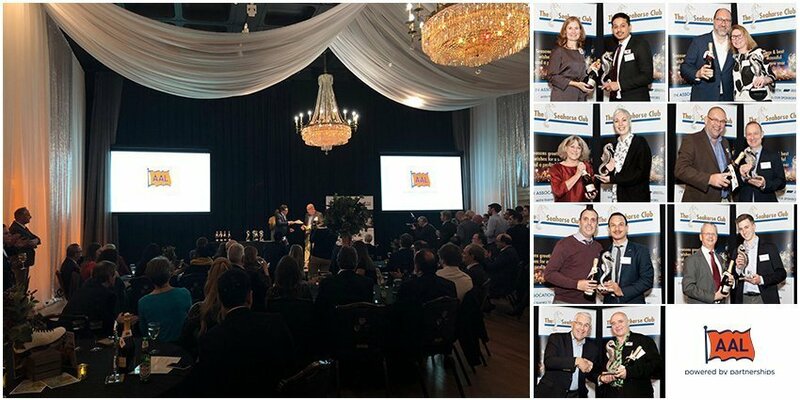 We hope that these awards acknowledge the many unsung heroes working within our sector whose expertise, hard work and dogged determination keeps breakbulk and heavy lift project cargo moving smoothly between every compass point,” said AAL’s managing director Kyriacos Panayides. 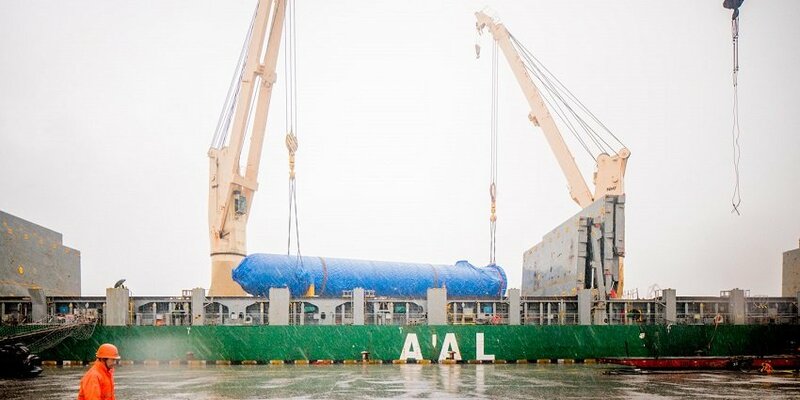 As one of the world’s largest and most trusted operators, multipurpose carrier AAL has served the global breakbulk and heavy lift project cargo industry for a quarter of a century, operating across the energy, oil & gas, mining, forestry, leisure, agriculture and construction industries. AAL provides customers with three distinct service models, including bespoke tramp and projects solutions to any location; scheduled liner services between Asia and Oceania; and semi-liner services combining fixed-routes with highly flexible port calls. 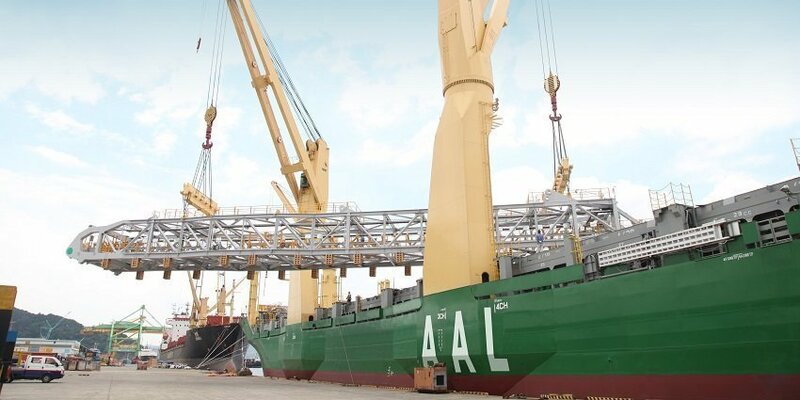 AAL’s growing fleet of owned and chartered heavy lift multipurpose vessels is the sector’s youngest and spearheads the ‘mega-mpv’ (30,000+ dwt) segment, providing shippers with best-in-class economies of scale and cargo intake volumes. With a multilingual office network spanning Asia, Oceania, Middle East, Europe, Africa and the Americas, as well as the sector’s finest commercial, engineering and operations professionals, AAL is able to locally address a global customer base 24/7. Find out more about AAL’s services here. Subscribe to AAL’s mailing list today: https://su.vc/aalsubscriptionform. Congratulations to all 12 winners on the night! 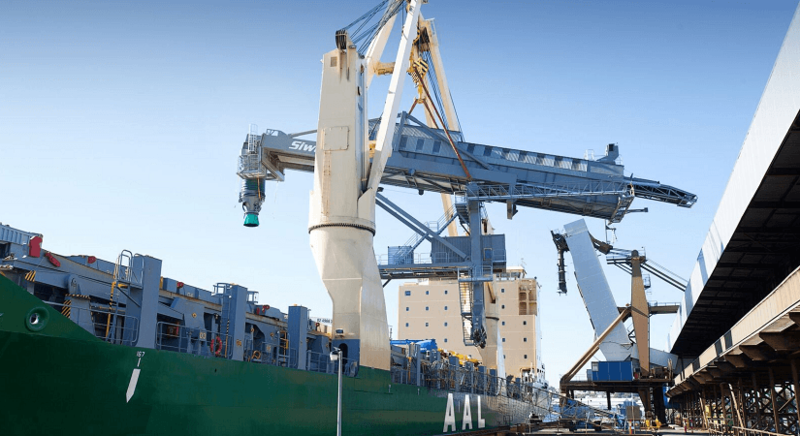 AAL has launched ‘AAL Italia’, based in Genoa, in response to the growing demand within Italy for greater and more competitive tramp and project shipping options to and from major trading points around the world. This expanded Italian market presence will strengthen AAL’s European network and underlines its ongoing strategy to offer local shippers value-added access to the global multipurpose and project heavy-lift trade. The move boosts AAL’s on-ground capabilities within the third largest national economy in the eurozone and twelfth largest by GDP in the world. AAL Italia is run by Chartering Director Alessandro De Vincentiis and President Michela Villa, both of whom have experience of working with AAL since 2015. They bring unrivalled local expertise and customer support ethics to a region experiencing real growth and development, especially in sectors like renewable energy. Felix Schoeller, added; “We are always on the look-out for strong opportunities like this one that can benefit our customers, service offering and business development objectives. Italian shippers are well served not only by two well-established and regular semi-liner services – ‘Asia – N. America – Europe’, and ‘Europe – Middle East – Asia & AUS’ – but also highly flexible and competitive tramp services. AAL Italia will work hand-in-hand with our European hub office in Hamburg under the direction of Regional GM, Eike Muentz. AAL’s specialist MPV fleet is one of the market’s youngest and biggest, combining extreme heavy lift capability (700mt max) with leading in-take capacity. Through a unique triage of award-winning services – Tramp, Semi-Liner & Liner – it has served the multipurpose cargo demands of oil & gas, energy, mining, infrastructure and forestry sectors across the world for almost 25 years. 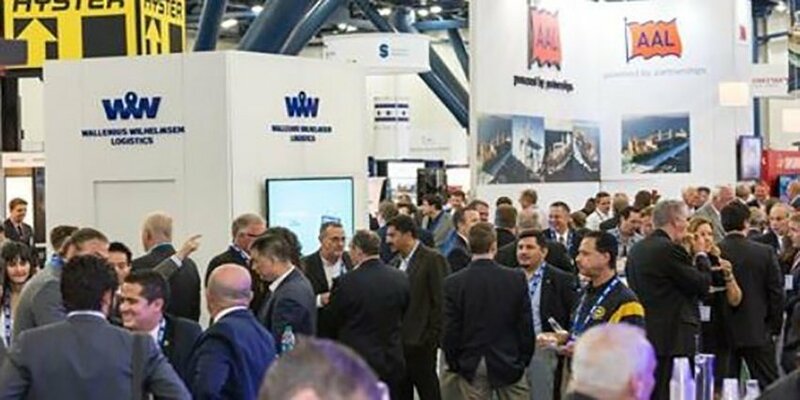 Breakbulk Americas is North America’s premiere heavy-lift project and breakbulk expo and this year’s event (3-4 October 2018) attracted over 4,700 delegates from all over the region. AAL stole the show with some out-of-box ideas to look even more ‘authentically American’ for its local US customers and to attract a larger delegate audience to its exhibition stand. Instead of a traditional exhibition stand, AAL hired an authentic 1950s US ‘Airsteam’ trailer for the show. 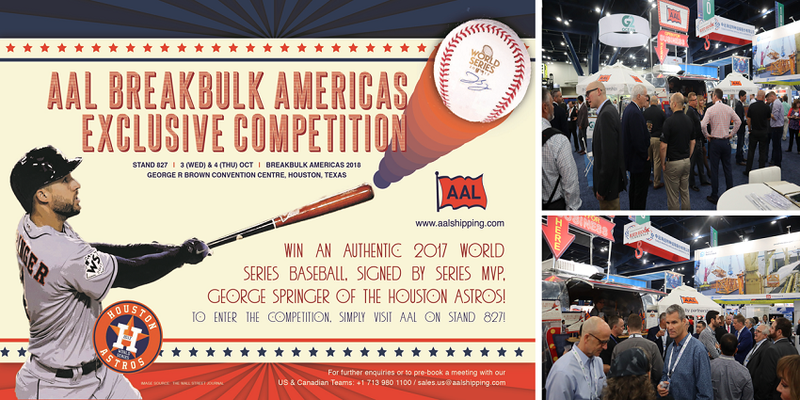 From this converted food-truck, positioned right in the middle of the expo hall, AAL served hot snacks and cold draught beer to its customers and ran a unique customer competition to WIN an authentic 2017 World Series Houston Astros baseball, signed by MVP George Springer. The Competition was linked to an online exit poll created to measure stand visitor perceptions of AAL and its local services. 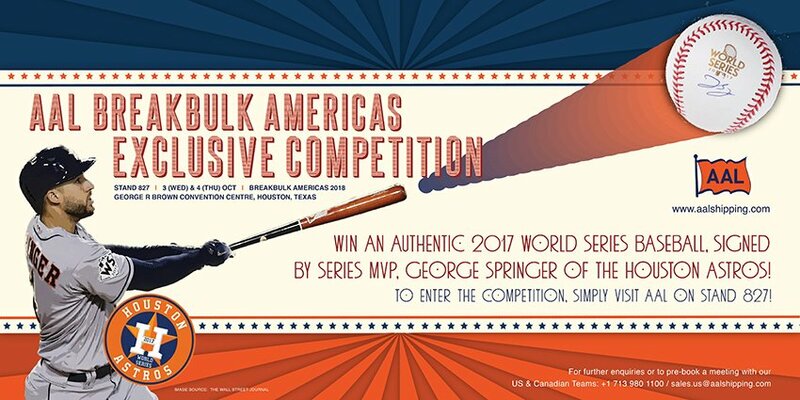 The winner of the limited edition baseball was Joye Runfola, Senior Project Logistics Specialist at Air Liquide and huge Astros fan. 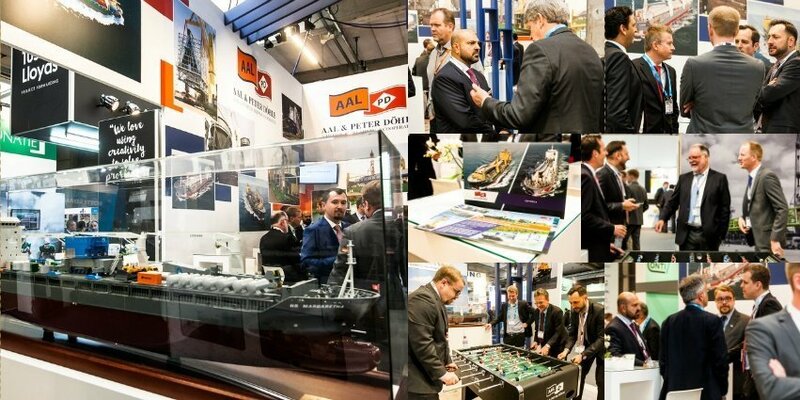 The end result was that AAL had nearly 500 visitors to its stand during the 2-day show – its largest audience to an expo stand anywhere in the world. 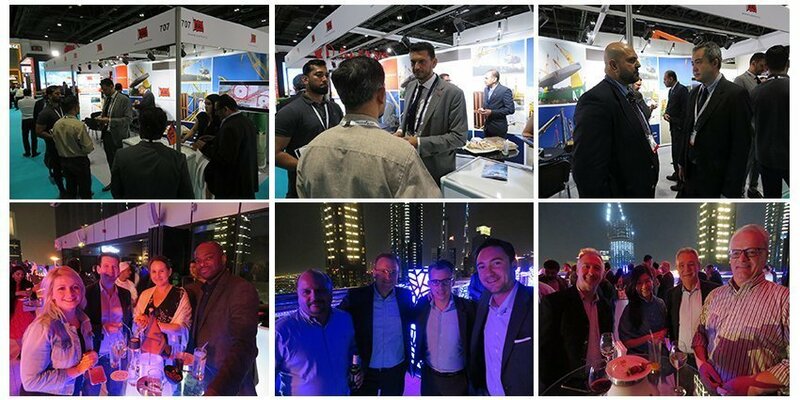 In addition, the carrier received rave reviews from both the Expo organisers and all attending delegates about its original and compelling presence and presentation. Michael Morland is AAL’s new General Manager of USA. 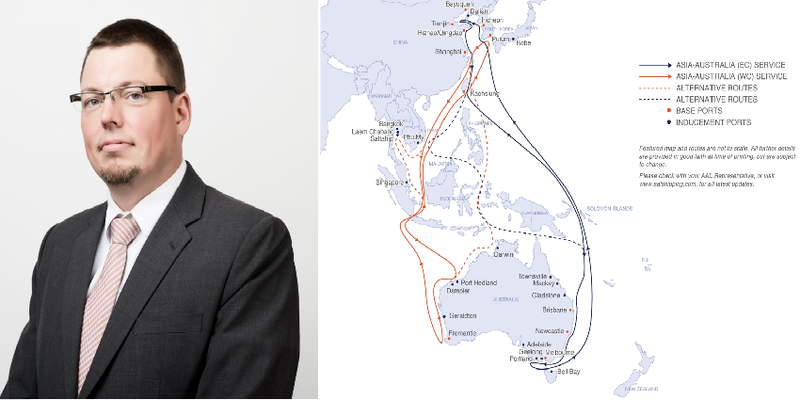 Following the appointment of Marc Schutzbier as Canadian Commercial Manager at the end of 2017, Michael’s appointment continues to strengthen AAL’s North American expansion strategy and the promotion of its growing capacity and portfolio of highly competitive MPV services – comprising tailor-made chartering solutions and scheduled semi-liner sailings that offer US customers regular and seamless ‘around-the-world’ connectivity. Michael brings over 17 years international experience in the shipping, offshore, and maritime industries. 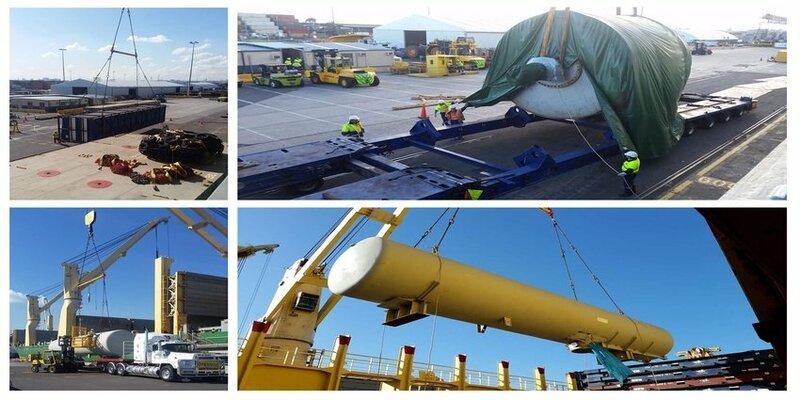 This specifically includes the heavy lift, project cargo and breakbulk market, having previously served in senior executive roles at Global Ocean AS and T.P. Shipping AS where he developed US and UK subsidiaries of both companies. Michael was educated at DPH Technical College & BI Norwegian Business School with Shipping & Finance modules from Copenhagen Business School. Commenting on his appointment, Morland said, ‘I am very excited by the opportunity to spearhead AAL’s US presence and to promote its expanded shipping capabilities to serve project and commodity cargo customers with highly competitive services into and out of the Americas via both the Pacific and Atlantic trade routes. AAL USES ‘VACULIFT’ TECHNOLOGY, IN AUSSIE FIRST! AAL has announced the successful deployment for the first time in Australia of multi-lift ‘vacuum pad’ units, used in the discharge of pipes with its partner Qube. 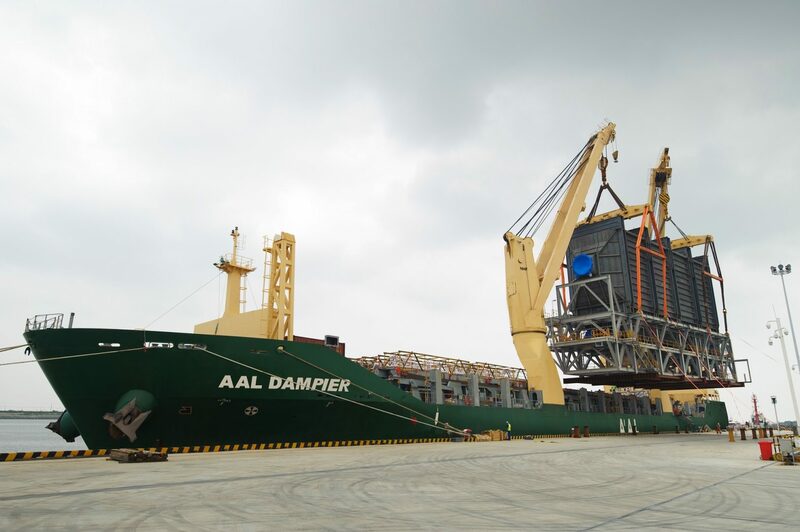 The cargo, which comprised 24,996 steel coated pipes units (18m in length each and weighing a total of 13,386t),was loaded in Baoshan China and discharged in Darwin, via AAL’s global tramp and chartering service and its S-Class multipurpose heavy lift vessel, the AAL Bangkok (19,000dwt). This was the first time that this lifting technology, which uses multiple vacuum pads to attach and lift the pipes, has been deployed in an Australian port. The cargo was delivered by AAL to Darwin for the Bao Australia pipeline, for which Qube has been contracted for cargo discharge and landside operations for the Tanami Gas Pipeline Project. 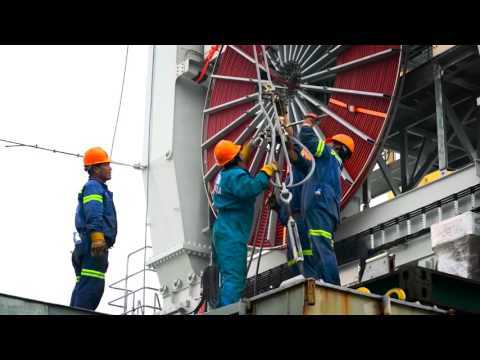 Traditionally, pipeline handling operations are handled by ‘hooking up’ the pipe during vessel discharge. Landside activity has also typically harnessed crane and pipe grapling hooks for handling. 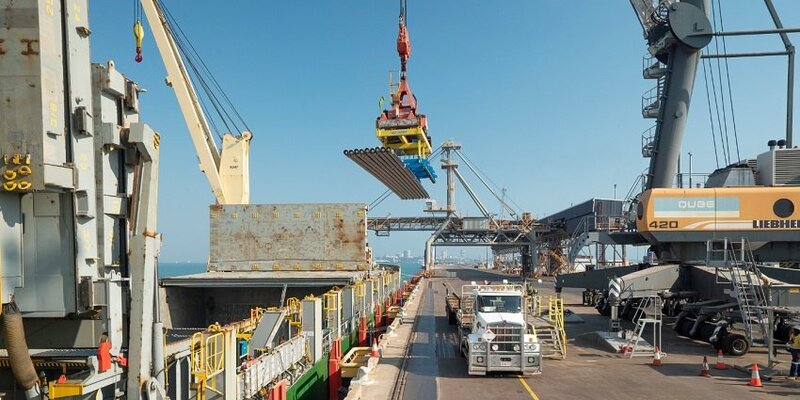 However AAL and Qube, Australia’s largest integrated provider of import and export logistics services, deployed the use of these innovative multi-lift vacuum units for the entire discharge operation in Darwin. Nicola Pacifico commented, ‘The multi-lift vacuum units were successfully commissioned and operational throughout the operation, while maintaining zero lost time injuries (LTI) and reducing operational safety risks, by eliminating the use of hooks. Data analysed before, during, and after the operation demonstrated increased productivity, improved risk mitigation and ultimately cost savings that could be passed down to our customers. The use of this technology also added to the quality of the operation, thanks to the improved and less abrasive handling which protected the integrity of the pipeline coating. AAL EXPANDS ASIA TO AUS WEST COAST SERVICE! Global MPV leader AAL is boosting its scheduled North & South East Asia to West Coast Australia Liner Service (AUWC) to a monthly service with the addition of a second MPV vessel. The expansion comes on the back of very strong growth (16% in 2017/1018) for Western Australia’s $109 billion mineral and petroleum industry* – due mainly to rising commodity prices, stronger than expected export demand and growing local production. 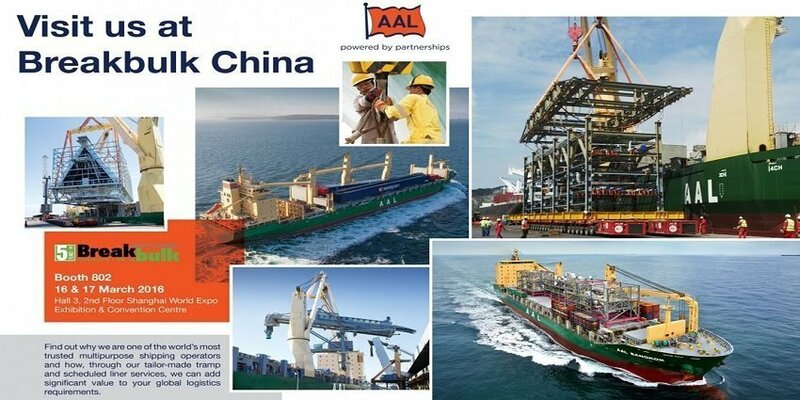 AAL’s AUWC service has served the breakbulk and project heavy-lift shipping community in the region since 2006 and is the only MPV liner service between North Asia and the Australian West Coast offering regular sailings from Shanghai, Pusan and Kaohsiung to Fremantle as well as Port Headland / Dampier on inducement). The service currently employs tonnage from AAL’s owned S-Class MPV fleet (19,000 dwt and featuring a combined maximum lifting capacity of 700 mt). From next month, an additional S-Class will be deployed, to expand the service to a monthly rotation and provide additional capacity to support increased volumes of mining, oil & gas and infrastructure cargoes. 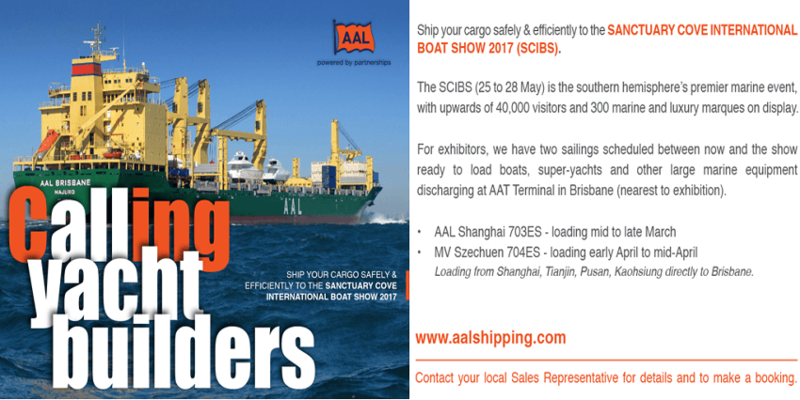 AAL serves the Australian market with a comprehensive range of MPV shipping solutions, comprising two scheduled liner services – its Asia to Australia West Coast Service (AUWC) and its Asia to Australia East Coast Service (AUEC) – and tailor-made Tramp solutions for more bespoke requirements. AAL TRIUMPHS AGAIN AT AFLAS AWARDS! AAL, one of the world’s leading global breakbulk and heavy lift operators, has been named ‘Best Shipping Line – Project Cargo’ at the prestigious 2018 Asian Freight, Logistics and Supply Chain (AFLAS) Awards, held in Shanghai, China. 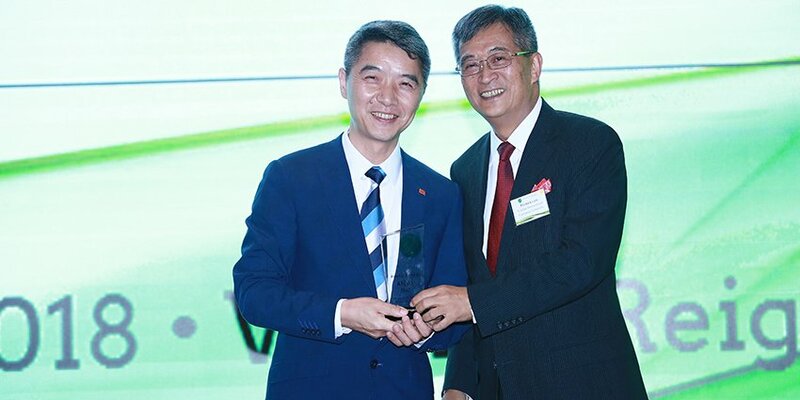 The AFLAS Awards are a celebration of Asia’s freight, logistics and supply chain industry, and AAL beat off intense competition from the sector’s leading carriers to win the award for the fifth consecutive year. AAL WINS TOP PROJECT CARGO AWARD! 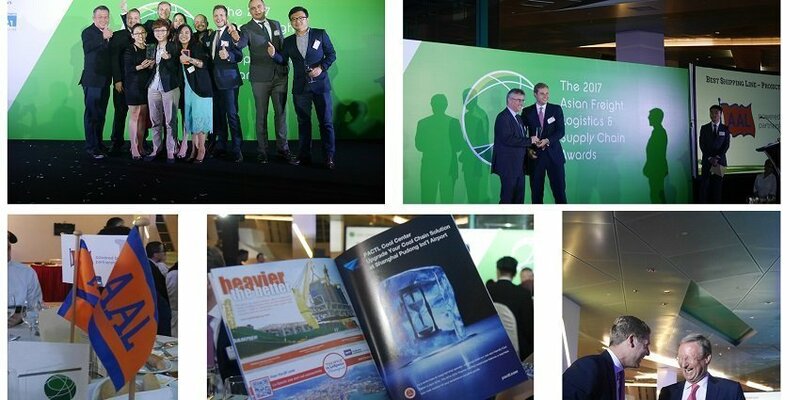 Last night in Shanghai, at one of Asia’s most celebrated Shipping Awards, the AFLAS Awards, AAL beat out all other leading carriers to win the prestigious ‘Best Shipping Line – Project Cargo’ honour. 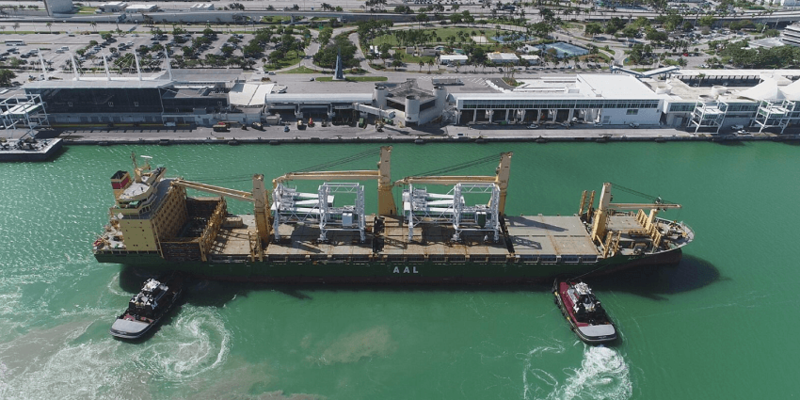 AAL has completed its first cargo shipment in partnership with new Spanish Representative, Marítima Davila, transporting two giant Seaport Passenger Boarding Bridges (SPBB) to PortMiami in a single sailing. With the ink not yet dry on their exclusive nationwide agency agreement, AAL and its new Spanish Representative, Marítima Davila of Grupo Davila booked and transported an impressive cargo of giant heavy lift port infrastructure components from Barcelona to the world’s largest and busiest cruise port, PortMiami. The cargo comprised of two giant tailor-made and fully assembled Seaport Passenger Boarding Bridges (SPBB), destined for PortMiami’s newly renovated ‘Terminal F’ where they will assist in the safe transit of many of the port’s 4.8 million annual cruise passengers. Both walkways, measuring 32 metres long and weighing 205 tonnes each, were transported in a single sailing aboard the AAL Singapore, one of AAL’s ‘Mega-MPV’ 31,000 dwt A-Class vessels. The unique four-sectioned, telescopic SPBBs were designed by Spain’s premier seaport, airport and road transport engineering company, Adelte, and were tailor-made to the exact specifications of PortMiami’s Cruise Ship Terminal F and the ships of more than 300m from bow to stern that will be docking there. Christophe Grammare, Commercial Director at AAL, commented: “What a great way to christen a new partnership. We are delighted how well the team at Marítima Davila and our own team at AAL Europe (Hamburg) cooperated to provide our European customer with a seamless end-to-end service that fully met the time and cost efficiencies they required. AAL’s strategic objective to become carrier of choice for the world’s most dynamic industry projects is boosted this month with a simultaneous and carefully planned expansion of its European team, agency network and service capabilities. AAL is enhancing its European infrastructure with the expansion of its local team and agency network and development of its global MPV shipping capabilities. Its already strong and well-established Hamburg team is bolstered with the appointment of Eike Muentz to General Manager Europe and Jan-Henrik Heyken to Senior Chartering Manager Europe. 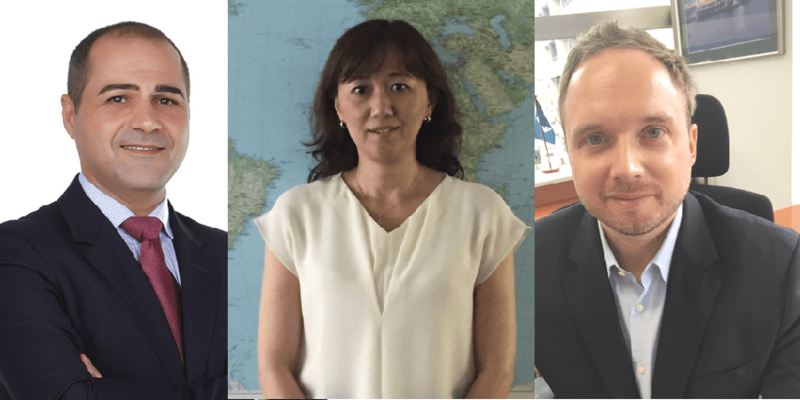 Simultaneously, it is expanding its European agency network, with Maritima Davila (Grupo Davila) in Spain, Breakbulk Project Agencies in France (a division of Shipping Agency Service Le Havre) and De Keyser Thornton in Belgium (to cover Benelux). Part of a strategy to position AAL as the ideal partner for emerging global projects controlled out of Europe, this activity comes hot on the back of its ongoing fleet expansion to service new semi-liner trades around the world and a new scheduled liner service between Asia and the Middle East. 28 February 2018, Aboard the AAL Hong Kong: Mr. Nam, the president of the Inchon Port Authority (IPA) welcomed the AAL Hong Kong and her crew into the Port and formally thanked AAL for their ongoing support of this South Korean gateway. The ceremony was part of the Authority’s ongoing drive to promote the Port to foreign and domestic ship-owners. One local TV Broadcaster is even preparing a documentary to celebrate the 100-year anniversary of the opening of the Inchon Gateway, to be broadcast on or around 17th March 2018. 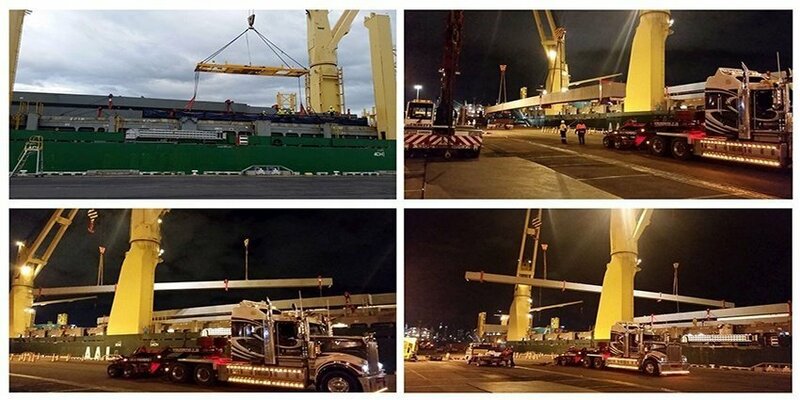 AAL SHIPS 45 OF AUSTRALIA’S LONGEST WINDMILL BLADES ON A SINGLE SAILING INTO ADELAIDE, FOR COLI BREMEN. 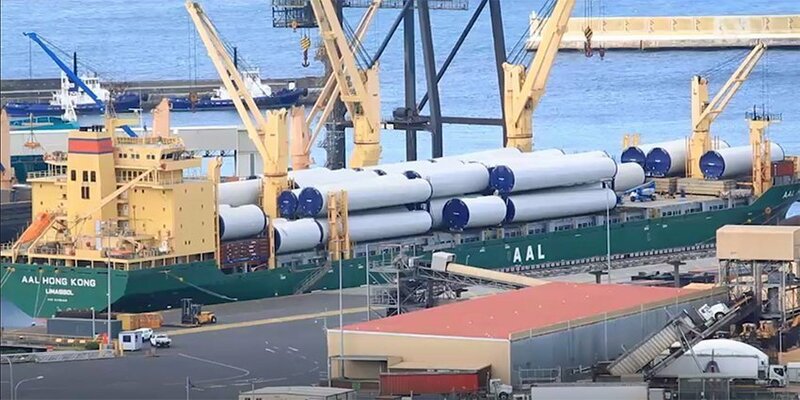 AAL has successfully completed three sailings into Adelaide with 45 windmill blades, turbine generators and other related components on each sailing, destined for the new AGL Silverton Windfarm in the Barrier Ranges of New South Wales. Comprising 58 turbines, the windfarm will reduce Co2 emissions by 655,000 tonnes annually and produce 200MW capacity (780,000 MWh of renewable energy) each year – enough power to maintain more than 137,000 Australian homes. At 63 meters in length, the blades carried by AAL are the longest ever to be shipped into Australia. 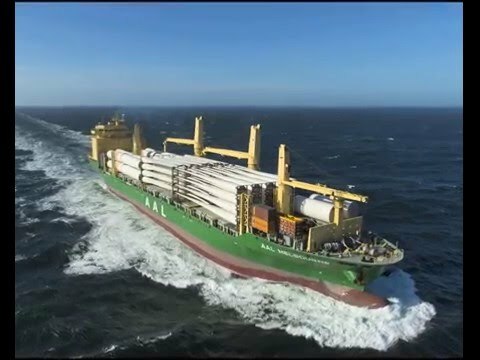 The Silverton Windfarm sailing is part a larger series of renewable energy cargo shipments into Australia carried out by AAL in partnership with COLI Schiffahrt & Transport GmbH (COLI) in Bremen. 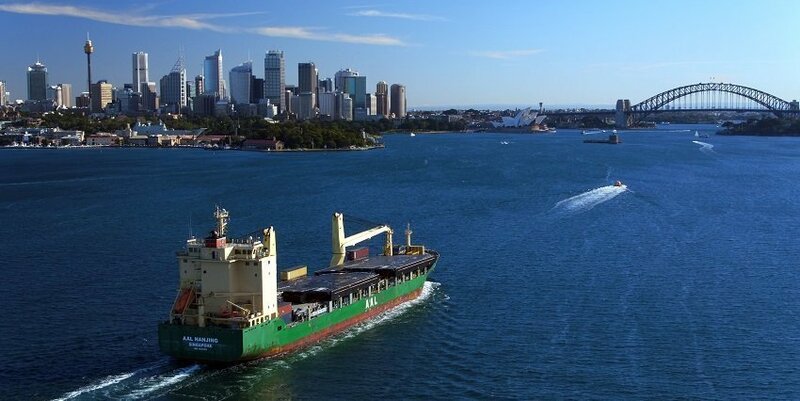 The total series comprises seven sailings into the Australian Ports of Adelaide, Newcastle and Kembla and harnesses the carrier’s ‘Mega-MPV’ 31,000dwt A-Class vessels, loading and transporting wind components from production facilities in Germany, Spain and China. Specialist multipurpose carriers and long-standing collaborators, AAL and Hyundai Merchant Marine (HMM), are entering an exciting global cooperation that will see both carriers expand their trade route coverage, sailings frequency, and MPV fleet capacity. The cooperation will create a joint Far East – Middle East MPV Liner Service, served by five MPV vessels and a scheduled bi-monthly rotation. It will also see the expansion of HMM’s services portfolio with global tramp solutions, and semi-liner services provided by AAL. Both carriers will remain independent and promote these expanded services under their own respective brands. The new Far East – Middle East MPV Liner Service will provide regular and scheduled sailings for breakbulk, project heavy-lift and general cargo shippers with five highly flexible MPV vessels (four 30,100dwt 640-Class from HMM and one 31,000dwt A-Class from AAL) on a 15 and 30-day sailing rotation. The service will connect the Asian markets of China, Korea, Japan, Indonesia and Singapore with the Middle East via the Persian Gulf and Red Sea routes. Capacity and port coverage will be jointly coordinated, but each carrier will issue separate schedules to their customers, who’ll be able book space on any vessel serving the trade. Namir Khanbabi, Chartering & Operations Director of AAL, explained: “AAL has run successful MPV liner services between Asia and its key trade partners for more than 20 years, and our expertise in collecting and combining multiple cargo types and parcel sizes on regular scheduled sailings provides significant value and efficiencies for our customers in multiple industry sectors. “By pooling our resources with HMM, we can each offer more comprehensive service portfolios with improved frequency, capacity, coverage, and economies of scale for our customers. There will be no collaboration on pricing and we will each pursue bookings under our own respective brands, with separate commercial teams and bills of lading. HMM is also expanding its portfolio with a range of global bespoke tramp solutions and semi-liner services – connecting the Americas, Europe, Middle East and Asia – operated by AAL. These flexible and multiple award-winning services are powered by a fleet of MPV vessels that combine extreme heavy-lift capacity with market-leading cargo intake and are served by AAL’s renowned in-house operations and engineering teams. Seung-il Park, General Manager of HMM, commented: “We’ve established a leading position with Korea’s dynamic energy and infrastructure industries, operating regular multipurpose sailings between Asia and the West. 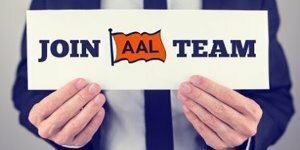 These same customers can now take advantage of the exciting new services that our cooperation with AAL will bring, without seeing any change to either the team or the process by which they make their current bookings. September 2017 – The multipurpose shipping sector’s most highly decorated carrier, AAL, has successfully completed the transport and discharge of the replacement structure for the iconic Johnson Street Bridge in Victoria, British Columbia – shipped from Shanghai along the carrier’s popular Pacific Service (Connecting North Asia and The Americas), aboard its 31,000dwt A-Class vessel, the AAL Singapore and for leading freight forwarder, Deugro. At 42.7m in length, 18.6m wide, and 4.1m tall bridge section is the largest component of the biggest single-leaf bascule bridge in Canada and one of the largest in the world. When the new bridge officially opens in March 2018 it will create a new historic structure and destination within Victoria’s Inner Harbour. The architect who designed the original Johnson Street Bridge, Joseph Strauss, would later go on to design the Golden Gate Bridge in San Francisco. AAL’s specialist mpp fleet is the market’s youngest and combines extreme lifting capability (700mt) with leading in-take capacity, with tonnage ranging from 19,000 to 33,000dwt. 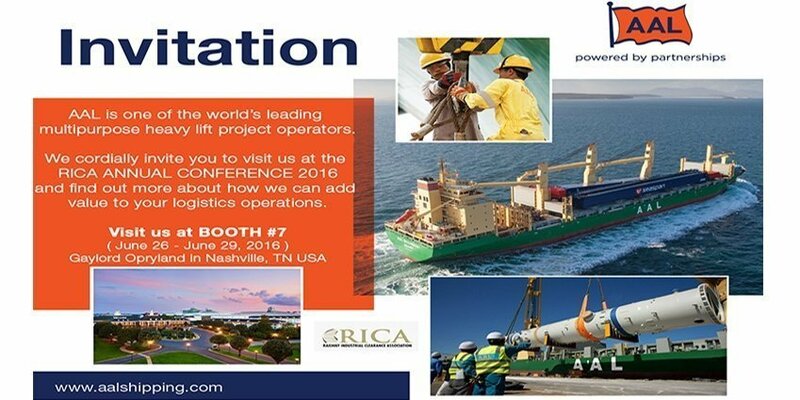 Through a unique triad of award-winning services – Chartering, Liner Services and Semi-Liner Services – it serves the 24/7 demands of global oil & gas, renewable energy, agriculture, mining, forestry, and construction sector project customers. 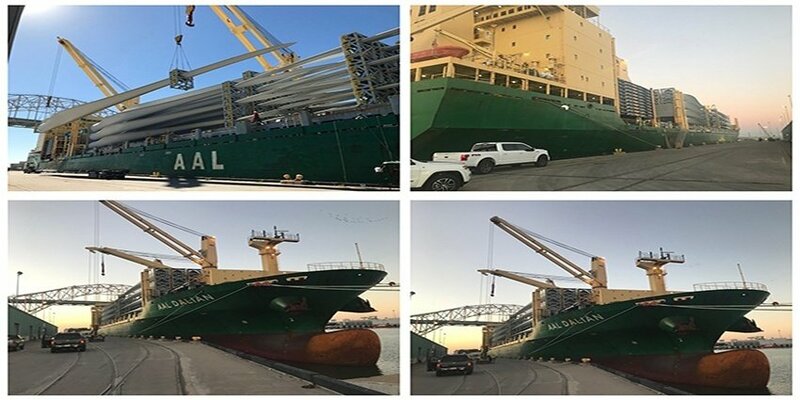 AAL executing the successful discharge of 51 giant windmill blades in Corpus Christi USA, transported from Taicang in China. AAL WINS BEST ASIA PACIFIC PROJECT CARRIER 2017! Singapore 26 October 2017 – AAL won the Logistics Award at this year’s Lloyd’s List Asia Pacific Awards. This latest win is our fifth since 2016, making it the most awarded MPP (multipurpose) carrier in the world. The Lloyd’s List Award series recognises shipping industry successes and sets a benchmark for excellence while rewarding innovative ideas that push the boundaries of what is possible. In presenting the Logistics Award to AAL, the judges highlighted AAL’s strong metrics in offering a trio of liner, semi-liner and tramp services for high-value cargoes to, from and within the Asia-Pacific region. 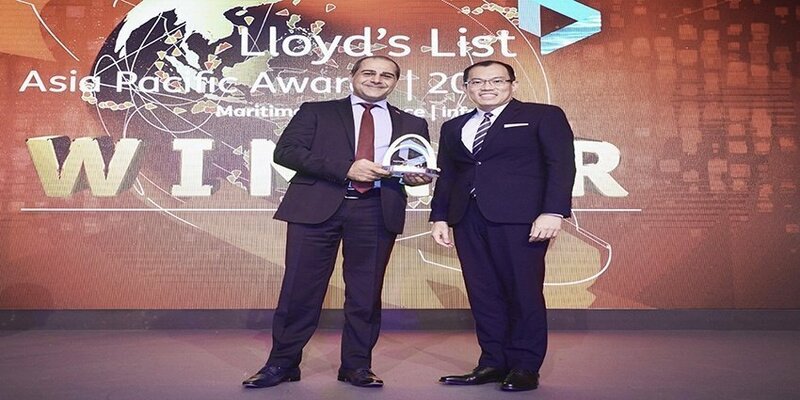 The Lloyd’s List Asia Pacific Awards are one of the world’s largest and most prestigious and 2017 marked its 20-year anniversary. The black-tie event was attended by over 450 executives from Asia’s leading shipping and logistics related companies. 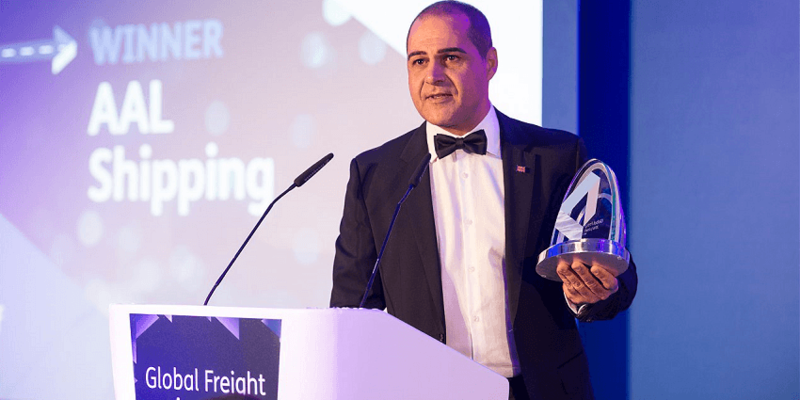 The Logistics Award, sponsored by PSA, was collected by Kyriacos Panayides who commented: “AAL has a strong Asia-Pacific heritage and we are proud of the role we play in connecting the region with the rest of the world, for which this award is much appreciated recognition. This is also AAL’s fifth global award since 2016 and such honours from our industry peers attest to the professionalism and dedication of our shore and onboard teams. HIGH FIVE – LATEST WIN AT THE LLOYD’s LIST ASIA AWARDS 2017, SECURES AAL ITS PLACE AS WORLD’S MOST AWARDED MPP CARRIER! 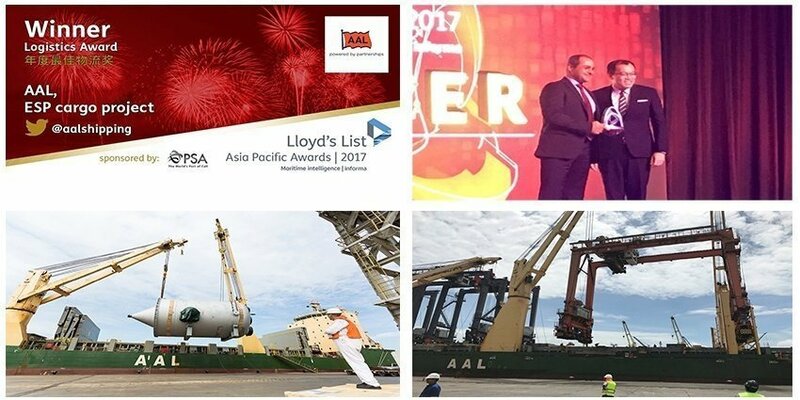 26.10.17 – Singapore, at the Lloyd’s List Asia-Pacific Awards 2017, AAL won the LOGISTICS AWARD 2017! This prestigious win marks AAL’s fifth global award since 2016, making AAL the world’s most awarded carrier and attests to the market-leading service quality that we strive to provide – services that truly put us above the rest. AAL Japan is terminating its Commercial Agency cooperation with Keystone Logistics and has nominated CPC (Consolidated Pool Carriers (Asia) Co. Ltd) as its new Commercial Agent in the Country. Lars Feller, Managing Director of CPC Asia, concluded, ‘We are delighted with the appointment. It is a great opportunity for us and the wider COLI Group and will provide major benefits and increased options to our valued customers and partners in the trade lanes and regarding tonnage. We are confident that this relationship will thrive and strengthen the long-term and wider relationship between our companies. THE REAL MEN OF STEEL! 15 September 2017 – AAL Hong Kong seen discharging structural steel (Volume: 1,582 RT) in Melbourne – destined for the Monash Freeway Upgrade. FRIEND OF AAL? GET A 25% DISCOUNT! 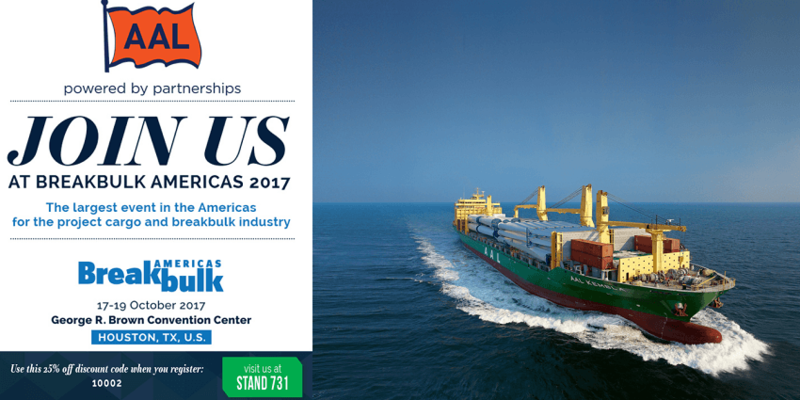 13 September 2017 – All customers and friends of AAL get a 25% DISCOUNT on their registration for Breakbulk Americas 2017. 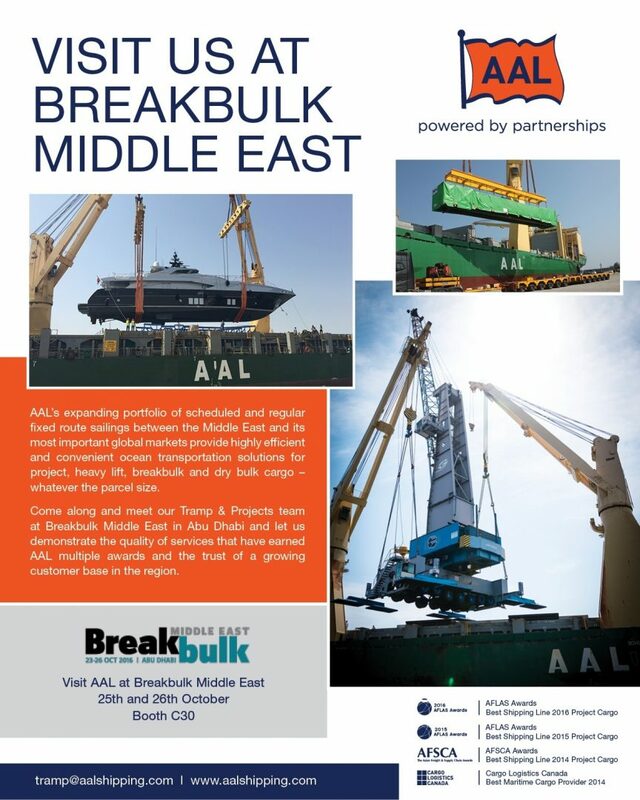 Simply, go to www.breakbulk.com/bbam2017 and use AAL’s special exhibitor discount code ‘10002’. We’ll see you in Houston, on Booth 731. 4 September 2017 – 33,000 dwt Paris Trader is seen loading a large cargo of dismantled gas plant components in Kemaman Port, Malaysia for discharge in Dighi, India. AAL LOADS THE NEW CROWN JEWEL OF VICTORIA HARBOR! 1 September 2017 – AAL Singapore is seen loading Bridge Leaf and OSD Panels (L42.74m x W18.6m x H7.96m, Wt 367mt) with accessories in Shanghai, Luojing Terminal destined for Victoria, Ogden Port. 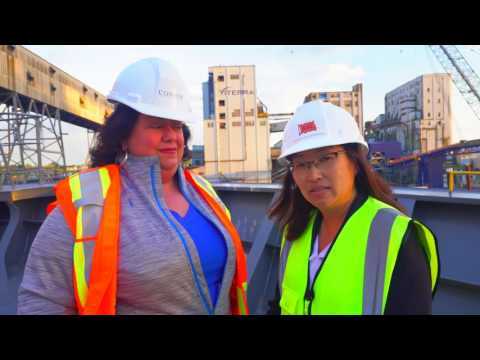 Cargo is for the project “Johnson Street Bridge” in the construction industry by Deugro. SIX RTGs SAIL COAST TO COAST, DOWN MEXICO WAY! 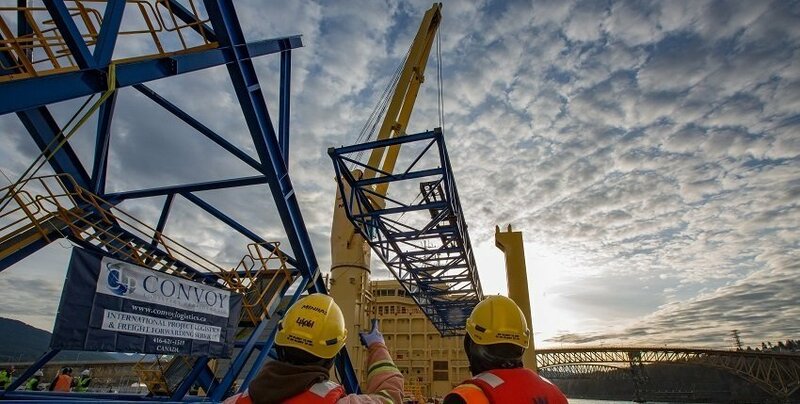 August 2017 – AAL successfully completed the movement of six giant gantry cranes from Lazaro Cardenas on the Mexican west coast to Veracruz on its east coast, booked by AAL’s Tramp & Projects team. 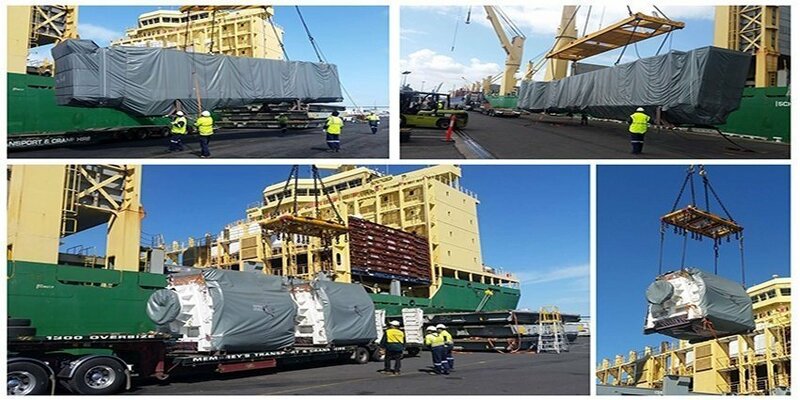 The shipment was carried out by the AAL Brisbane on behalf of a leading provider of port equipment, engineering and productivity solutions. The six Rubber Tyred Gantry Cranes (RTGs) will be utilised at the Hutchison Ports ICAVE, a specialised container terminal at Veracruz. Each unit weighed up to 190 tonnes and 28m height, 26m length and 13m width. A combination of their weight and extreme size dimensions meant that AAL was one of the few carriers with the specialist skills, expertise and vessels to safely and efficiently fulfil the shipment. 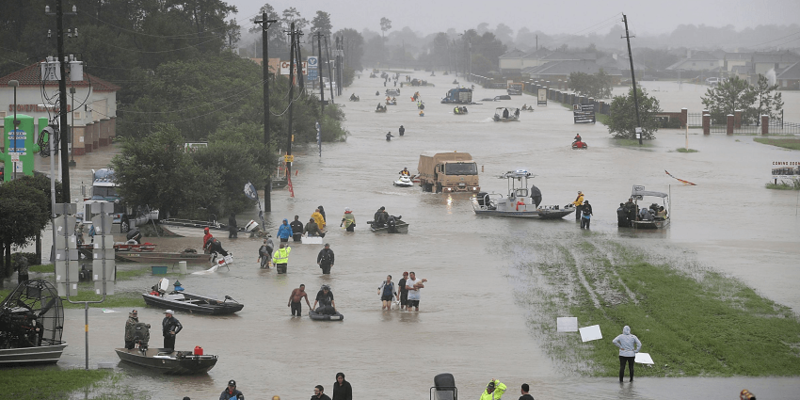 Following the terrible Hurricane Harvey flooding in Texas, we have closely monitored the situation in Houston via our close colleagues there on the ground. Some of those we work with have been displaced and many, many more in need too. Please consider making a donation to the official Hurricane Relief Fund, to help local families reestablish themselves. We send our hopes and thoughts go to the entire Houston community, during this time. Our image library is packed with amazing and memorable photo-shoots in British Columbia that Dave shot for us and his work with our colleagues at ‘BC Shipping’ Magazine was always appreciated. A fine man and a great talent, sorely missed. RIP from all of us here at AAL. A YANKEE WELCOME IN SUNNY MELBOURNE! 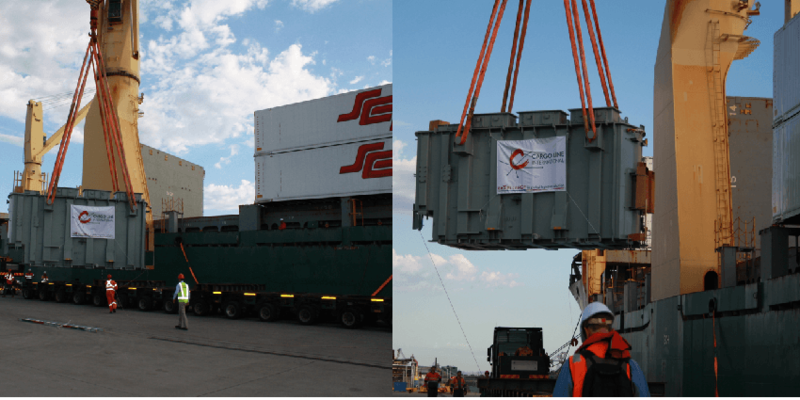 31.7.17 – 31,000dwt AAL Shanghai discharging a cargo shipment in Melbourne comprising Yankee Dryer, transformer, tanks and other smaller parcels. WHEN THE GOING GETS TOUGH..! 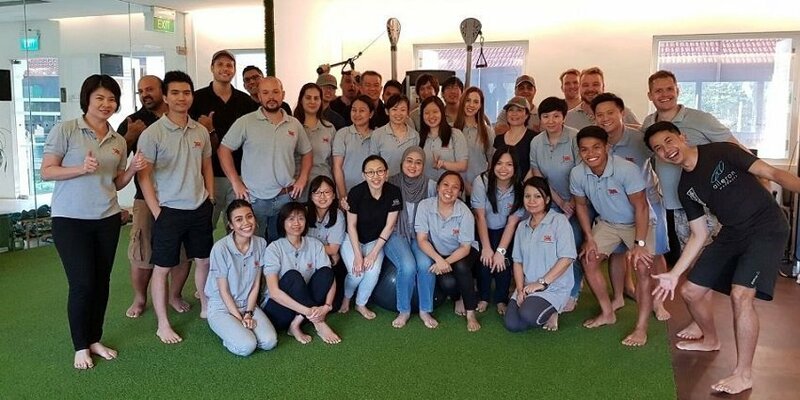 AAL Singapore broke a sweat on Friday 28th July, when the whole team attended a team-building and stress-busting boot camp afternoon on Sentosa Island. JAPANESE CUSTOMERS PAY SINGAPORE A VISIT! 19.07.17: A group of important Japanese customers were yesterday treated to an exclusive visit to the AAL Singapore in the Port of Yokohama. The group were invited along to see the Singapore in action and were treated to a private tour of the 31,000dwt A-Class vessel by her Master, Captain Fomicevs. She called in Yokohama to discharge a cargo of steel structures on her way to China – having returned from Vancouver along AAL’s Pacific Liner Service. AAL WINS TOP ASIA PROJECT SHIPPING AWARD, A FOURTH TIME! AAL beat off intense competition from the sector’s leading carriers, to win the prestigious ‘Best Shipping Line Project Cargo’ award at the high profile AFLAS Awards in Singapore last night (29.6.17) – the fourth consecutive year AAL has won in this category. The award was voted for by over 15,000 readers of ‘Asia Cargo News’ – shipping professionals, EPCs and project owners from across the world. This is an incredible achievement and one we should all be proud of – especially considering how hotly contested the award itself was this year, with other nominees including: Rickmers, Intermarine, Chipolbrok, Spliethoff, D-Ships and BigLift. 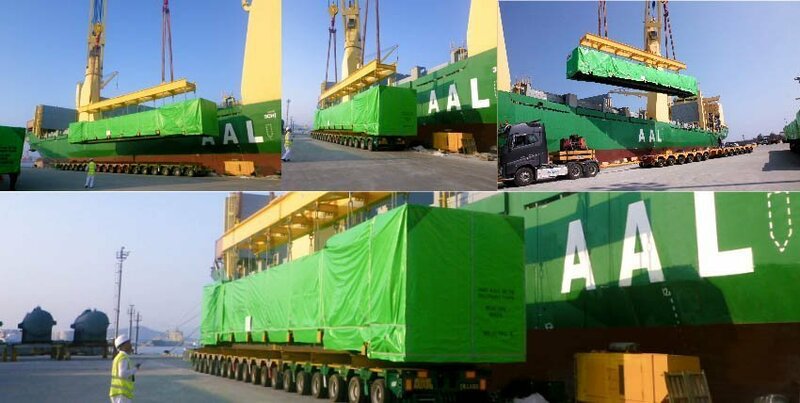 AAL has successfully completed the shipment of 13 enormous haulage trucks (170mt each) from Laem Chabang Port in Thailand to the Port of Nakhodka in southeast Russia. The shipment was booked by our Brisbane office and operated by the Tramp & Projects team. Watch the YOUTUBE video of this awesome shipmment here! 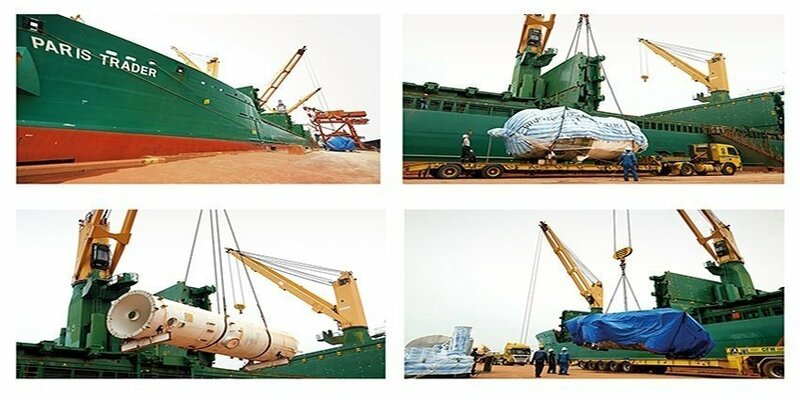 AAL has just completed its intense 9-month project shipment for LPL Projects + Logistics GmbH, to transport 194,561 freight tons of HRSG modules and related accessories (architectural steel and other components) from Ulsan and Penglai to the Egyptian ports of Sokhna and Adabiyah – cargo destined for the country’s largest-ever power generation project, the Siemens’ Megaproject. The cargo comprised 384 HRSG modules and 45,000 freight tons of accessories, transported on 17 sailings between South Korea, China and Egypt between August 2016 and May 2017. The modules will be used at the Beni Suef and New Capital Power Plants, two thirds of the biggest gas-fired combined-cycle power station in the world and one that will generate 14.4 GW – a boost of 45 percent to Egypt’s power capacity. Well done to all the AAL Team involved! The two cyclone or ‘tertiary’ vessels were loaded onto the AAL Fremantle in Mailiao, Taiwan, using her combined 700mt cranes to safely lift and stow the cargo into one of her three giant, box shaped holds and weather deck respectively. The units were discharged in Tanjung Setapa, ahead of their installation at Petronas’ refinery and petrochemical integrated development project (RAPID) in Pengerang, Southern Johor, Malaysia. The RAPID project covers an area of 2,000ha and, when fully operational in 2019, is expected to produce an estimated nine million tons of petroleum products and 4.5 million tons of petrochemicals a year. 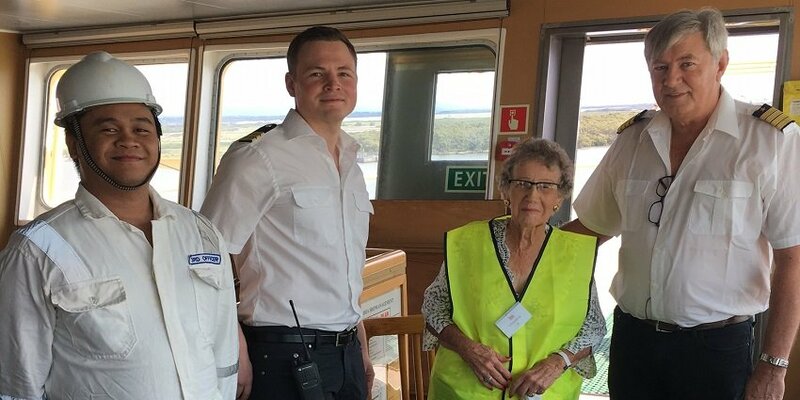 Brisbane, Australia – April 2017 – AAL was pleased to recently host the Mission To Seafarers and Australia’s Channel 9 aboard the AAL Shanghai to celebrate volunteer Marcia Scholes’s 70 years of helping seafarers in the Port of Brisbane. The Mission To Seafarers works in more than 200 ports in 50 countries caring for seafarers of all ranks, nationalities and beliefs – over 1.5 million people. Through its global network of chaplains, staff and volunteers it offers practical, emotional and spiritual support to seafarers through ship visits, drop-in seafarers’ centres and a range of welfare and emergency support services. 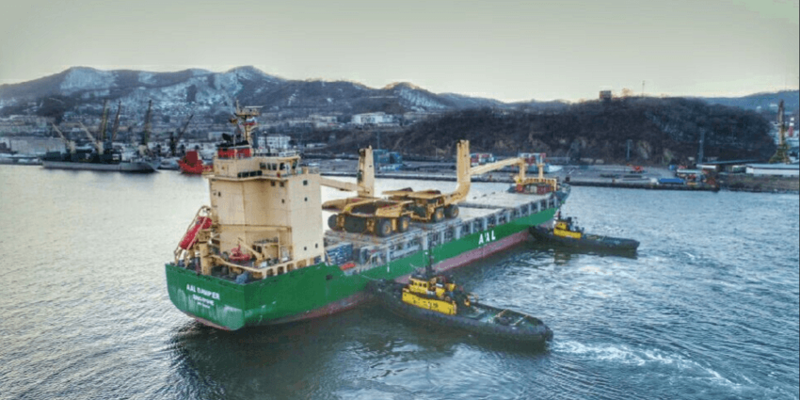 AAL recently harnessed one of its 19,000dwt S-Class multipurpose heavy lift vessels, the AAL Dampier, to deliver multiple giant truck units (weighing 160mt each) to the Port of Nakhodka in southeast Russia. 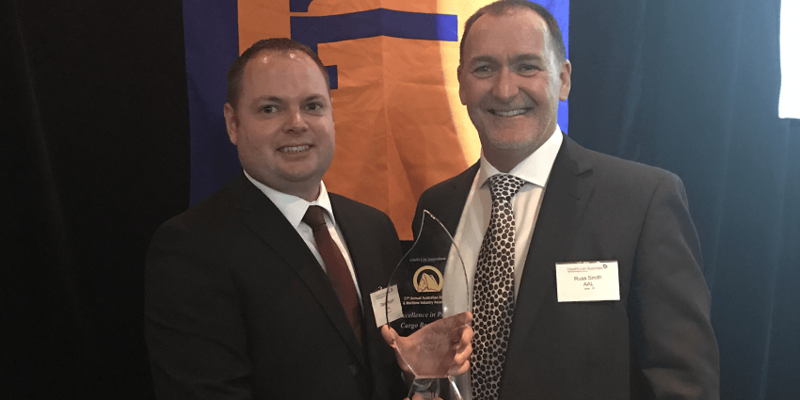 Its customer was Freightplus was recently awarded ‘International Freight Forwarder of the Year’ at the 2016 Australia Shipping Awards – where AAL also walked away with top honors in the multipurpose carrier category, ‘Excellence in Project Cargo’. Watch the video NOW here. 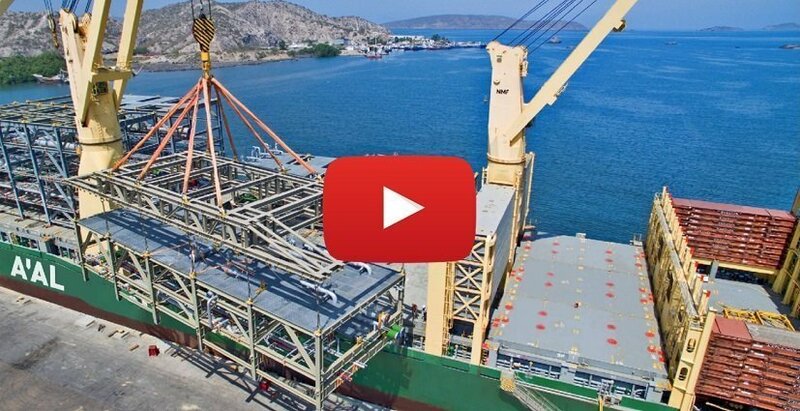 Click here to watch AAL in action, moving serious project, heavy-lift and breakbulk cargo for some of the world’s most demanding and exciting industries. CALLING YACHT BUILDERS & TRANSPORTERS! 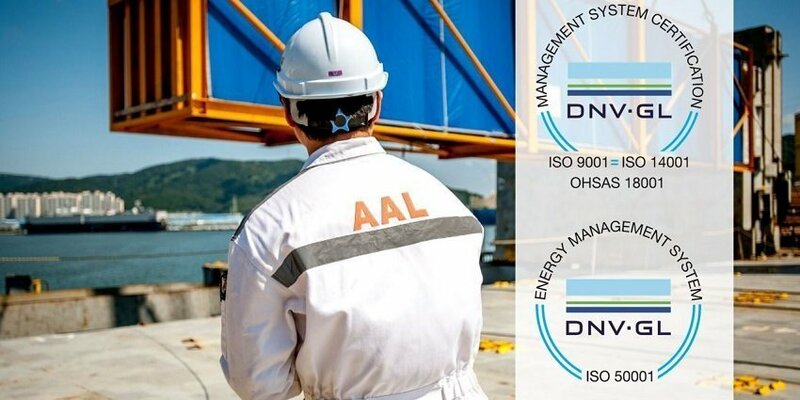 AAL is the first shipping company to be issued 2015 certifications – ISO 9001 for Quality Management and ISO 14001 for Environmental Management – by DNV–GL’s subsidiary office in Singapore. Awarded simultaneously as ISO 50001:2011 for Energy Management and OHSAS 18001:2007 for Occupational Health & Safety, they are a benchmark our commitment to build competitive advantage through the quality of our global services, infrastructure and internal and external operations. ‘These latest certifications represent core components of AAL’s day-to-day operational focus – management efficiency, environmental protection, energy conservation and commitment to health and safety. With the market at its most challenging, we’ve taken the bold step to invest significantly in our global operations, infrastructure and people and build the quality and range of services we offer as a clear point of differentiation between AAL and other carriers. We believe this is the only sustainable way to keep growing our reputation and our business with key customers worldwide.’ Commented Kyriacos Panayides. 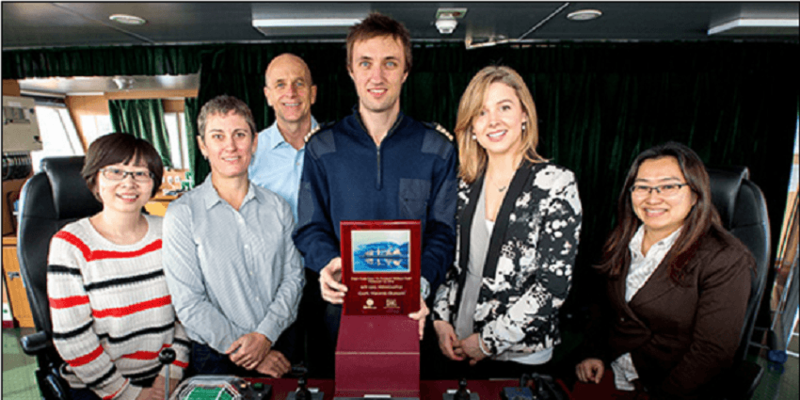 AAL KEEPS THE LIGHTS ON IN NEW SOUTH WALES! 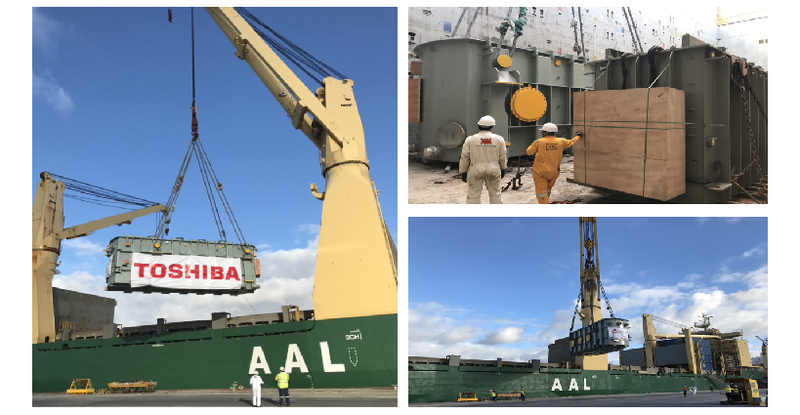 AAL and its customer Cargo Line International in Sydney, worked together this January to transport a 240 mt generator transformer, from Toshiba’s production facility in Shanghai, to Newcastle. Once installed on the New South Wales (NSW) power gird, the transformer will be able to change the voltage of electricity produced by the local power station. The unit was carried on our 31,000 dwt A-Class vessel, the AAL Shanghai and along our popular Asia – Australia East Coast (AUEC) Liner service. Thank-you to our brilliant Brisbane team for the story and pictures! 30-31 December, 2016: The AAL Fremantle loading two ‘cyclone vessels’ [500 mt each] in Mailiao, Taiwan and destined for Tanjung Setapa in Malaysia, for installation at the Petronas’ “RAPID” project. NEW AAL China Chief, Christophe Grammare, emphasizes importance of offering convenient and competitive trade routes between China and its global partners. At its first-ever formal ceremony held on 16 December 2016 at the Shanghai Guchun Park Hotel, the Shanghai Luojing Terminal – Shanghai’s biggest and most important breakbulk cargo hub – formally named and thanked key partners for their contribution to the terminal’s trade performance in 2016. AAL, who has been regularly calling at the Port since its opening, and in 2016 carried over 400,000 freighted tons of cargo through the port, was honored with a bronze model from the Terminal’s General Manager, Ren Sheng Hua. On Behalf of AAL, we take great pleasure in announcing that as of December 9 2016, Managing Director of our Liner Services Division, Christophe Grammare, has undertaken the additional role of AAL’s Chief Representative in Greater China – a position previously held by Wolfgang Harms, who leaves the company after almost four years’ loyal service. Christophe has over 10 years’ experience at the top level of AAL and has held senior positions for the company previously in China. We wish him every success in his new role and ask that you to please direct any relevant communication directly to Christophe at: c.grammare@aalshipping.com. We thank-you for your kind attention. 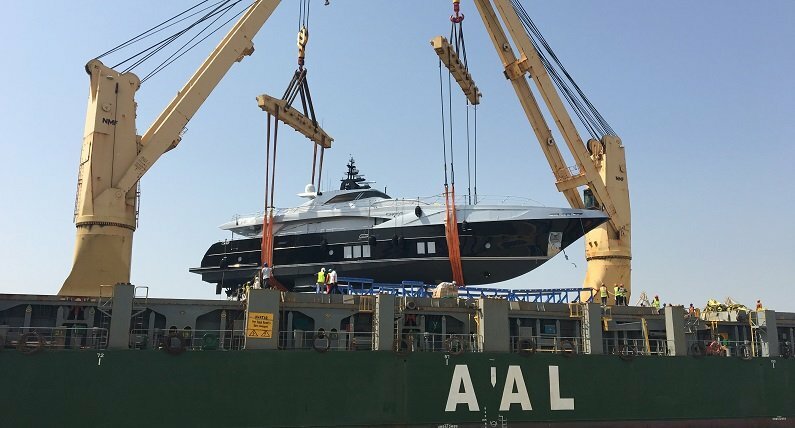 Last month, our Tramp & Projects division celebrated the launch of its new scheduled ‘Gulf-Asia’ semi-liner service in style by loading a 200mt super-yacht on its first call at the Dubai port of Jebel Ali. The handcrafted 37m luxury yacht is a Majesty 122 series, built by the renowned UAE manufacturer Gulf Craft and the model costs in excess of USD 11 million. 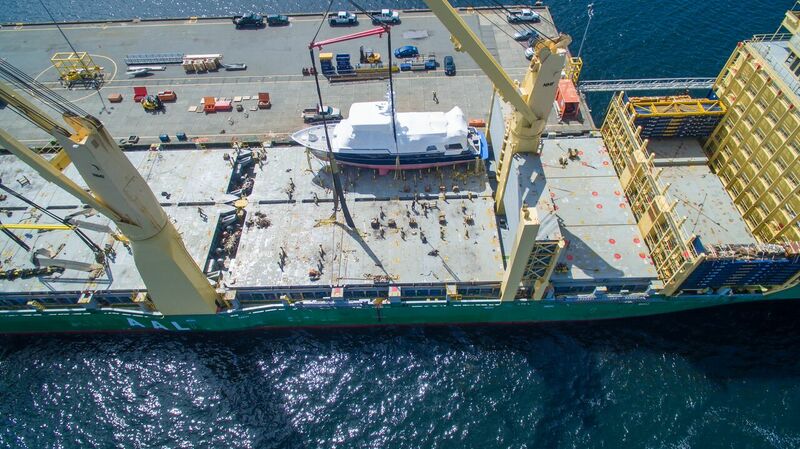 She was loaded with extreme care onto the A-Class AAL Fremantle, using her port-side mounted cranes and will be discharged in Newcastle, Australia for yacht transport and logistics provider, Cigisped in Dubai. 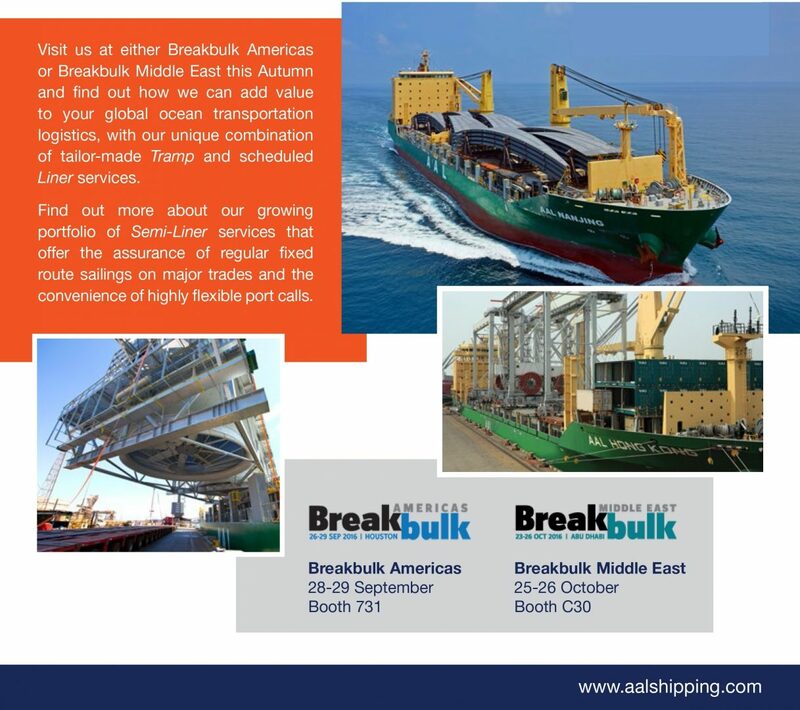 Visit us at Breakbulk Americas 2016, Wed 28th and Thu 29th September in Houston and find out how we can add value to your global ocean transportation logistics, with our unique combination of tailor-made Tramp and scheduled Liner services. Find out more about our growing portfolio of Semi-Liner services that offer the assurance of regular fixed route sailings on major trades and convenience of highly flexible port calls. 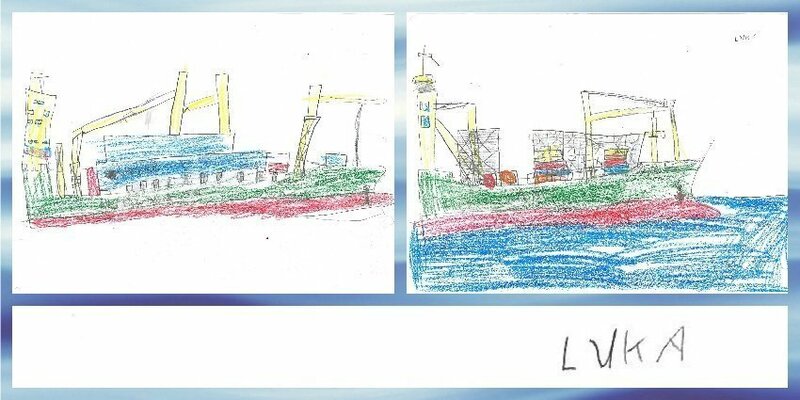 A big thank you to a budding young artist – 7-year old Luka (son of Silvija our Crewing Assistant in CSM Rijeka). His terrific depictions of our vessels: the A-Class ‘AAL Shanghai’ and S-Class ‘AAL Bangkok’ earns him an AAL goodie bag. Thank-you, Luka! Take a look at AAL and CSM teamwork in Lukas’ hometown, Rijeka. 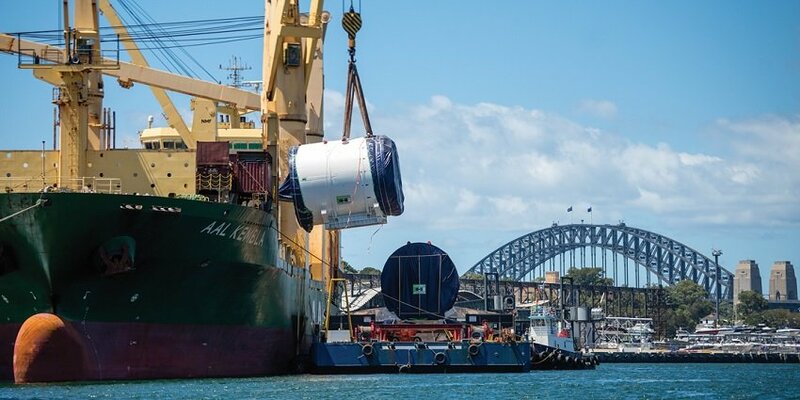 ‘Measure, Analyze, Rinse, Repeat’ – Excellent Breakbulk Magazine article by Carly Fields and featuring comment from our very own Felix Schoeller – plus an amazing image of our discharging a 410-tonne, air cooled condensing unit in Port Headland, Western Australia. This month, AAL successfully lifted and loaded one of the heaviest single units of cargo ever to board one of its vessels! 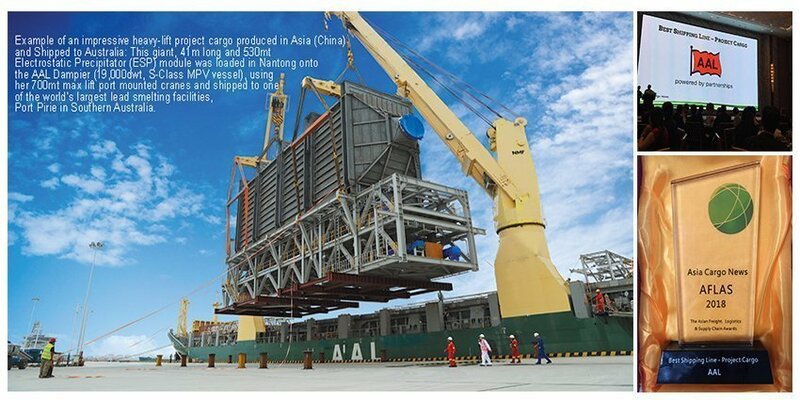 At well over 500mt, this oxidation furnace module component was loaded in China aboard the S-Class AAL Dampier and is destined for South Australia. More information to follow. 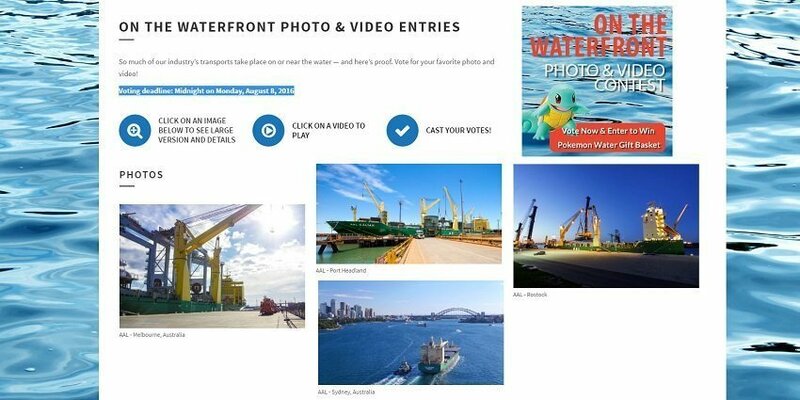 Breakbulk Magazine is running a fun photo contest for which AAL has entered 4 recent photos of project cargo and vessels. Whichever you like, please vote by midnight Monday August 8 2016. We thank-you in advance. AAL NANJING TAKES CENTER STAGE IN SYDNEY! Yesterday, the AAL Nanjing took center stage, on her way to delivering a shipment for the Barangaroo Ferry Hub Project (Sydney Harbour). Millions of Australians at home watched her Nanjing on Channel 9 and Channel 7 prime-time news delivering almost 600 tonnes of steel for the above project. The steel will be used to build a new and important ferry hub at Barangaroo South. Below is the AAL nanjing herself, proudly sailing towards the Sydney Opera House the Sydney Harbour Bridge with this impressive cargo. More photography and videography soon. AAL Dalian photographed by the Nanaimo Port Authority, while discharging a cargo of yachts in this very picturesque British Columbia port. Members of the AAL Operations Team taking a well-earned moment to reflect, having just coordinated the safe & successful loading and stowing of 4 giant ASC units onto the AAL Hong Kong, in some appalling Shanghai weather and visibility conditions. CATCH AAL ON TOUR THIS AUTUMN!! THE TEAM THAT WORKS HARD, PLAYS HARD! AAL Singapore turned out in full force, to celebrate a particularly busy time of new developments and exciting activity within AAL. The team were invited by the management to replace their work-wear with some casual gear and compete in an intra-office bowling competition on a Friday afternoon at the end of May. The event proved highly successful and provided a great opportunity for everyone to simply ‘let off steam’. With ice-cold beer flowing and everyone encouraged to mingle, the event proved less about bowling and more about getting together to socialise – and quite right too! 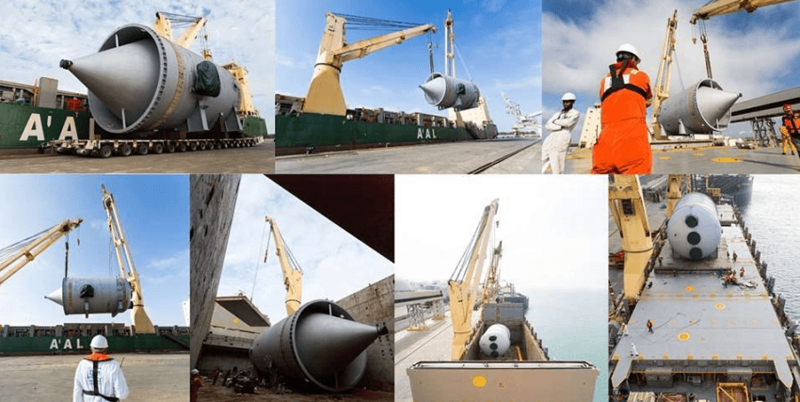 AAL LOADS 4 GIANT ASC UNITS ON A SINGLE SAILING – AN INDUSTRY FIRST! This short video shows how AAL engineered part of a series of shipments of 20 Automated Stacking Cranes ‘ASC’ – 473 sqm each unit – on multiple sailings from Shanghai to Melbourne, for final delivery to Victoria International Container Terminal. The combination of our Tramp & Liner Divisions working together deliver a seamless and cost-efficient solution. The cargo is transported along AAL’s scheduled Asia – East Coast Australia liner service, which offers 13 regular port calls on a 17-day rotation. Our 31,000dwt A-Class vessel ‘AAL Hong Kong’ was chosen for the task, as it provided 1,800 sqm of clear deck space and enabled 4 of these giant ASC units to be loaded and transported on a single sailing – the first time this has ever been done. 4 In-house AAL engineers worked in tandem in Asia & Australia to plan and oversee every stage of operations. 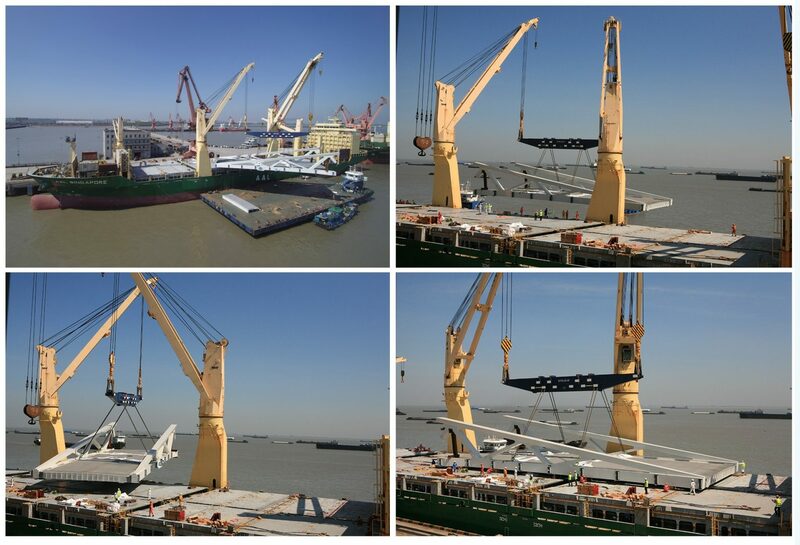 Loading and discharge of the ASC units required simultaneous operation of three on-board cranes. The professionalism and flexibility of AAL’s operational and engineering teams enabled changes up the last minute. 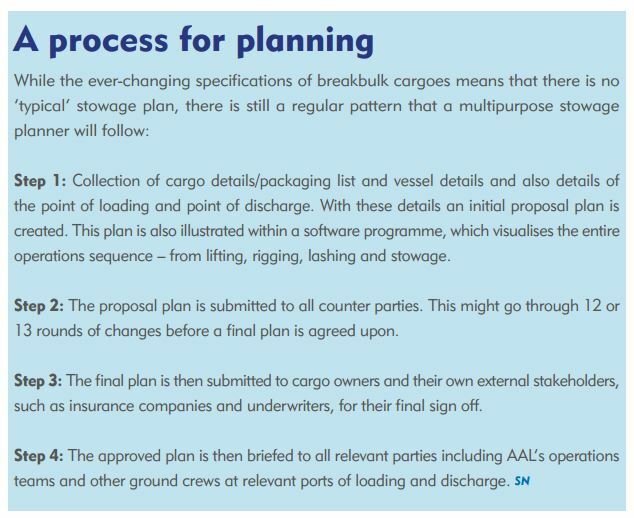 Acting as both ship owner and operator, AAL quickly signed-off major ship modifications needed to accommodate this huge cargo. The third shipment (featured in the video) was successfully loaded in Shanghai, during extremely poor weather and visibility conditions. AAL WINS ‘Best Shipping Line – Project Cargo’ AWARD FOR A 3RD YEAR RUNNING! 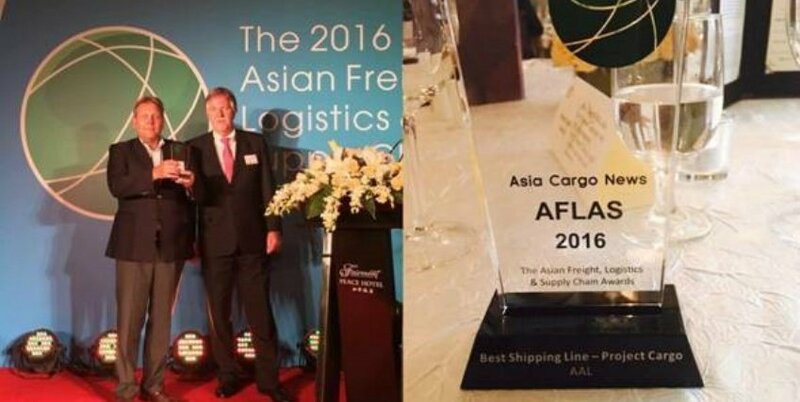 We announce with great pleasure that yesterday evening, at a packed ceremony at the Fairmont Peace Hotel in Shanghai, AAL won the Asia Freight & Supply Chain (AFLAS) 2016 Award for ‘Best Shipping Line – Project Cargo’! This is a record third consecutive time that AAL has won this award. Beating out other shortlisted carriers, that included Intermarine and Wallenius Whilhelmsen, the award was presented to our Deputy Managing Director, Wolfgang Harms. He attended the event on AAL’s behalf with the General Manager of our China Office, Zhao Jin Hai. 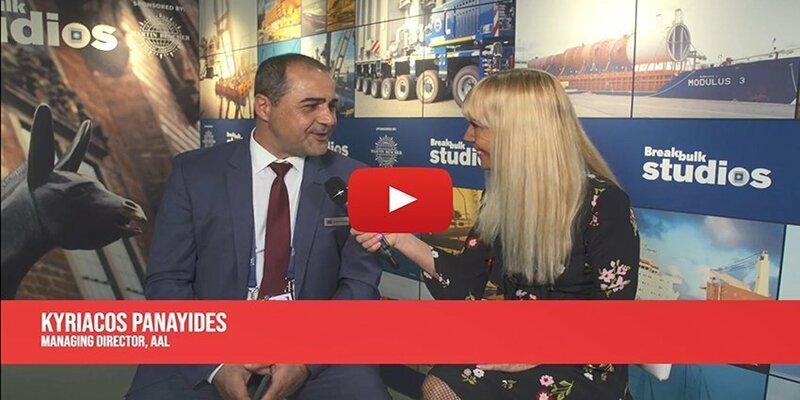 Our Managing Director, Kyriacos Panayides said of this lates achievement,‘It was extremely hard to make it onto the nominated shortlist for this award back in 2014, when we first won it. It was then twice as hard to hold onto the award for a second year. But, to be nominated for a third consecutive year and to win again is an incredible achievement. We thank our peers within the global shipping industry who voted for us and for their continued support and faith. ‘This achievement is dedicated to all our AAL personnel who – despite the pressure from the recessive global markets – keep delivering a superior service at every level of our organisation and constantly strive to deliver to our customer first-class global transport solutions. Not everything is about work and AAL is pleased to announce another evening with BPLG Members. If you had the pleasure of joining the previous event at Eleven Bar in April, you might remember that there was a donations desk at entry for the Zig Zag foundation to help kids in need. We have secured the elegant Brass Bar at the Pig & Whistle in Brunswick St, Fortitude Valley for this month’s frivolities. The evening will kick off at 5pm on Friday the 17th June – Happy Hour. Please take the time to catch up with the BPLG Members and our AAL team. This is another chance for all of you to join this exciting social event in which all project related professionals can relax and meet others in the industry without any hard selling taking place, and of course participate with a ‘note’ donation given at the entrance desk together with their business card. AAL looks forward to see you! AAL Japan’s one-year anniversary celebrations in Tokyo provided an opportunity for the country’s leading shipping industry stakeholders to come together and share cautious optimism about the industry’s economic outlook and predictions that heavy lift breakbulk cargo movement ex Japan into Asia will grow over the next 18 months. AAL’s anniversary celebrations at Meijikinenkan were attended by almost 200 guests and hosted by its Chairman, Heinrich Schoeller, alongside Managing Director, Kyriacos Panayides and other senior representatives of the multipurpose operator from around the world. Helping the mood of optimism about Japan’s project cargo exports was news that local engineering companies are involved with energy projects coming online in Taiwan, Vietnam, Thailand, Indonesia, Malaysia and Myanmar, as well as oil and gas developments in Indonesia, Vietnam and Thailand. Beyond Asia too, upcoming energy projects are being targeted in Africa and oil & gas projects on the US West Coast and Middle East are raising confidence and drawing focus away from a slowing China trade. Wolfgang Harms, Deputy Managing Director of AAL and head of its operations in Japan commented, ‘Japan’s position as the world’s third largest economy is very much by design. The engineering, industrial and commercial infrastructure and capabilities here are a leading example to the rest of the Asia and indeed many other markets around the world. Interviewed about the cargo discharge, May 2016. AAL & PD would like to thank all our customers, partners and friends who attended our evening reception on Tuesday 24th May at ‘9Beaufort’ in Antwerp’s prestigious MAS Museum. Attended by over 160 guests from the global multipurpose shipping industry, the event marked the one-year anniversary of the AAL & Peter Dohle Cooperation. 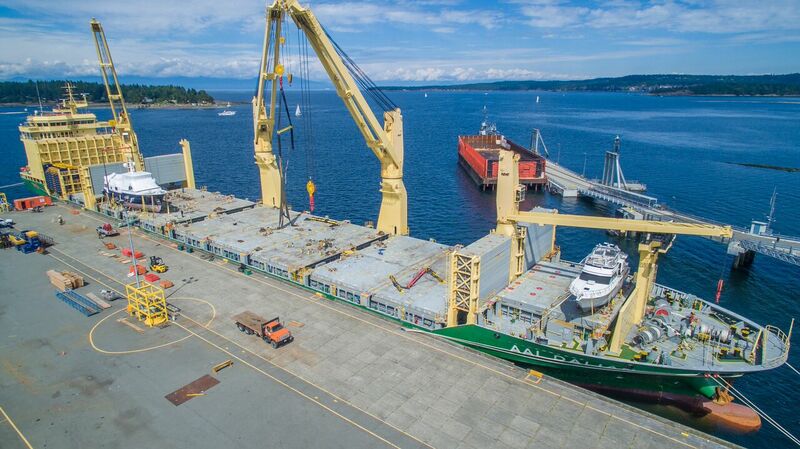 Leading multipurpose heavy lift operator AAL has completed a series of shipments to Port Metro Vancouver (PMV) of an innovative ‘mobile’ grain shiploader to be installed at the Port’s Pacific terminal run by Canada’s largest grain handler Viterra. The largest component was over 66m long and weighed 250mt and, once assembled and operational, will increase the Terminal’s shipping capacity and allow for the loading of post-Panamax sized vessels. The shiploader was transported from China along AAL’s Pacific Service between Asia and North America and aboard its 31,000 dwt A-Class vessel, the AAL Singapore. 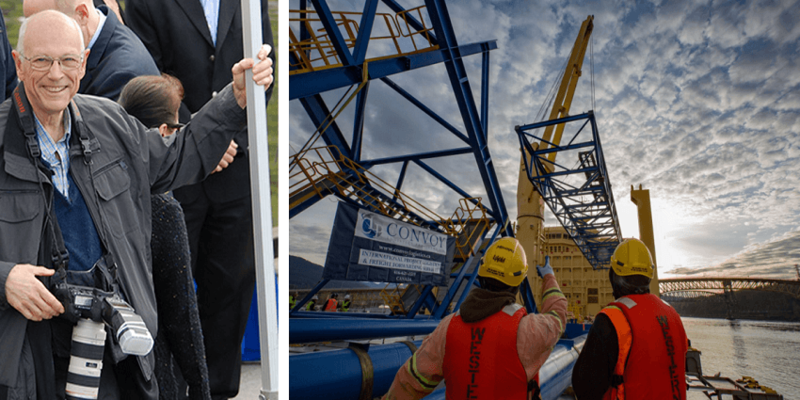 Responsible for logistics and planning was Ontario-based Convoy Logistics Providers Ltd. (CLP), appointed by bulk material systems expert EMS-TECH who designed and commissioned the shiploader. Breakbulk Europe 2016 provided us with a great forum for announcements about the expansion of our cooperation across the world with Peter Dohle. We would like to thank the many customers and partners who visited us during the 3 days of the show and welcome them to continue the dialogue of cooperation at anytime over the coming weeks and months. 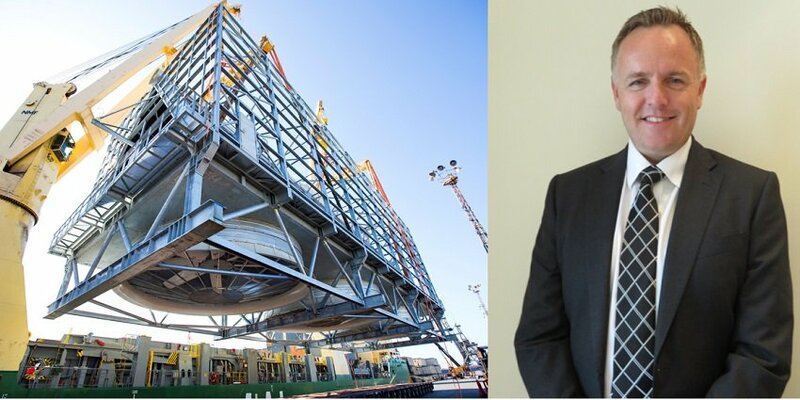 Leading multipurpose heavy lift operator AAL is set to strengthen its growing presence in the China region, with the appointment of specialist project and steel cargo freight forwarder Central Oceans, as Commercial Agent for Hong Kong and South China. 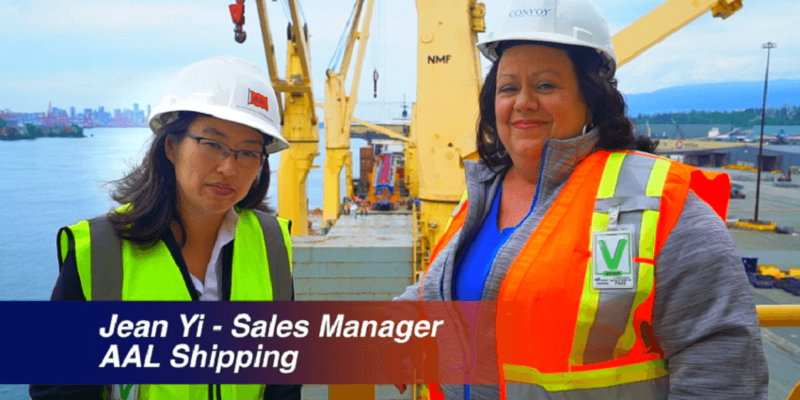 Sylvia Mak will manage joint activity for the cooperation, having been with Central Oceans since its agency operations started and herself highly regarded within the region’s shipping community. 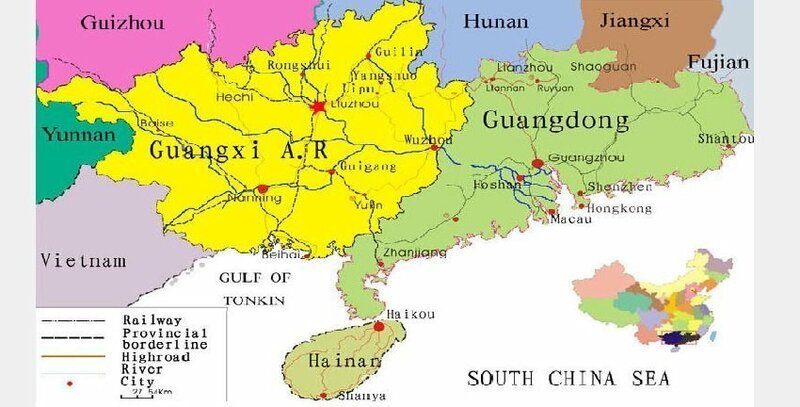 She is based in Wan Chai, Hong Kong and will liaise directly with AAL’s regional hub office in Shanghai. WE KNOW THAT CRANE FROM SOMEWHERE. Once an awesome heavy lift cargo, that traveled from China to Canada aboard the AAL Shanghai, the country’s largest gantry crane now stands proud in Vancouver. After the months of planning and preparations that went into the loading, shipment & discharge of this mega cargo, it is great to see her in action and looking so impressive! 18 April 2016 – American Journal of Transportation published an interesting article about AAL. To read the complete article by Peter Buxbaum click here. 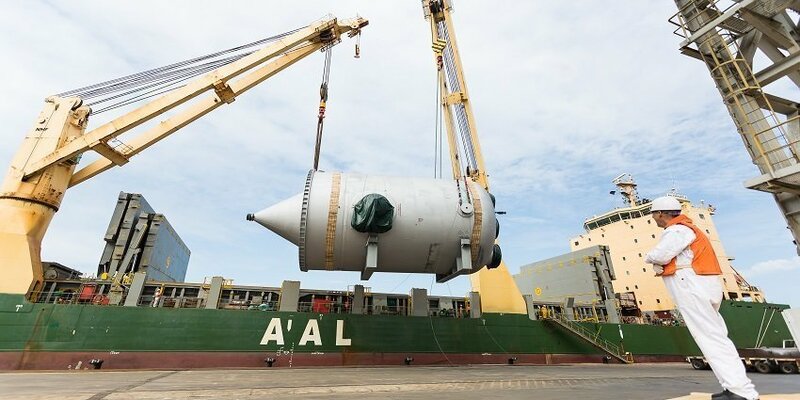 “AAL, an operator in the breakbulk, heavy lift, and project cargo industry, has achieved several milestones within the last few months. 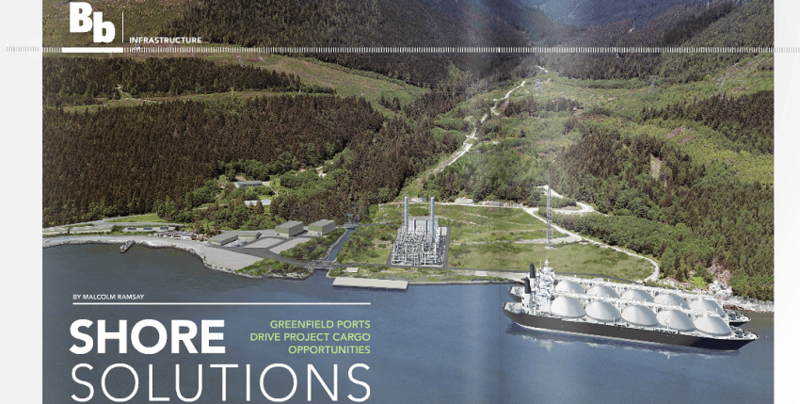 The developments include a first ship call at the Stewart World Port in British Columbia, the first deliveries to a petroleum project in Venezuela, and the establishment of a partnership with Swire Shipping. 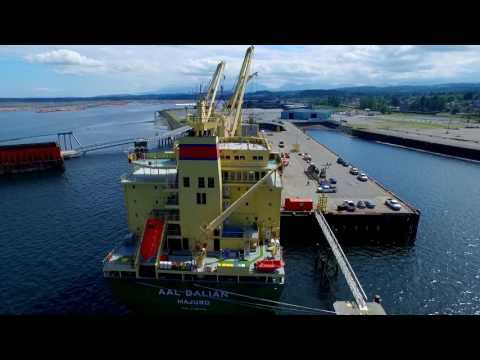 AAL’s recent inaugural sailing into Stewart World Port (SWP), British Columbia’s most northern ice-free trading point, was designed to provide increased choice and convenience for its mining, forestry, oil and gas and project cargo customers. “A port call option at SWP gives customers a wider choice that can ultimately impact the efficiency, delivery and competitiveness of their logistics operations,” said Felix Schoeller, general manager of AAL’s Pacific service. SOMETHING BIG JUST ARRIVED IN VANCOUVER!! AAL JAPAN CELEBRATES ITS ONE YEAR ANNIVERSARY IN STYLE! April 4 2016, Tokyo Japan: At a lavish reception held at Meijikinenkan and attended by over 180 guests, comprising some of Japan’s leading shipping industry stakeholders, AAL celebrated the one-year anniversary of the opening of AAL Japan. Our Chairman, Heinrich Schoeller formally greeted guests along with Managing Director, Kyriacos Panayides and the event was further attended by senior representatives of our sister company and ship manager of our fleet, Columbia Shipmanagement. Congratulations to Wolfgang Harms, Yuko Kimura and their team for their first year of business and we wish them every success in the future. 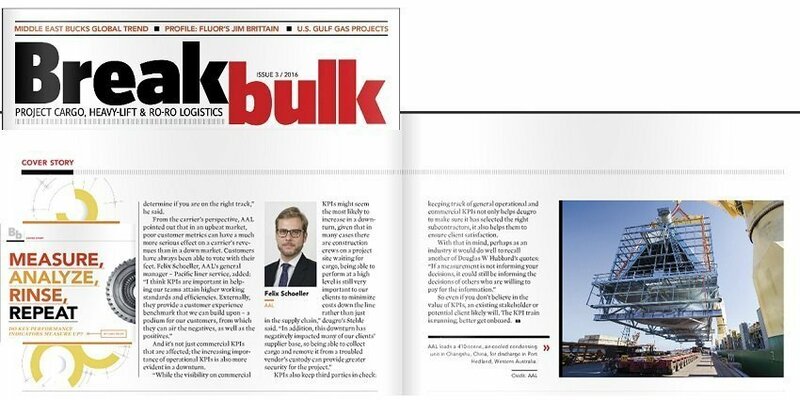 Christophe Grammare and Felix Schoeller interviewed in Breakbulk Magazine for a thought leadership article entitled, ‘Shore Solutions’. To read the whole article by Malcom Ramsay click here . 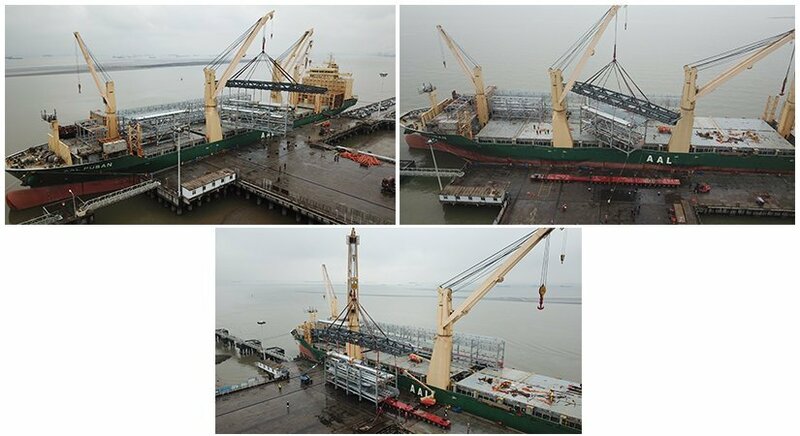 Here are some nice shots of our vessel AAL Dampier while loading topside module structures in Map Ta Phut on the 7 of March destined to Dalian COSCO Shipyard. With its inaugural sailing into Stewart World Port (SWP) on Friday 12 February, AAL is set to enhance its multipurpose trade with British Columbias most northern ice-free trading point and provide increased choice and convenience for its mining, forestry, oil and gas and project cargo customers. Opened in September 2015 and set in one of the most mineral rich areas of North America, SWP is not only a convenient gateway to North West BC and the Eastern Yukon, but with its deep sea berthing facility and fast transit time from North Asian ports, it also provides a competitive advantage for AALs global customers. 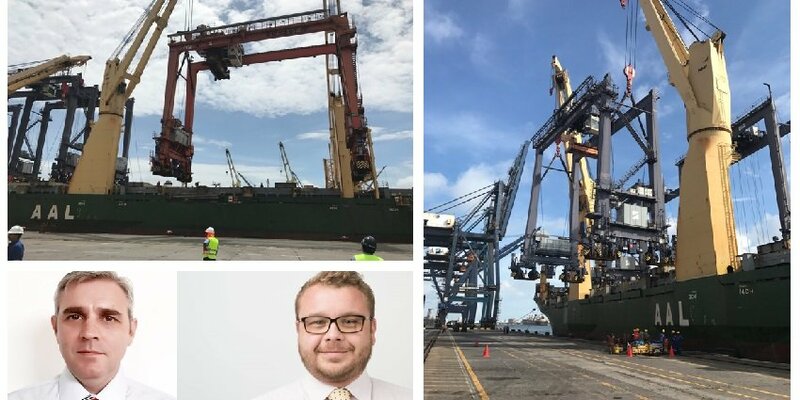 Felix Schoeller, General Manager of AAL’s Pacific Service, explained: A port call option at SWP, as part of our flexible and regular Pacific Service, gives customers a wider choice that can ultimately impact the efficiency, delivery and competitiveness of their logistics operations. 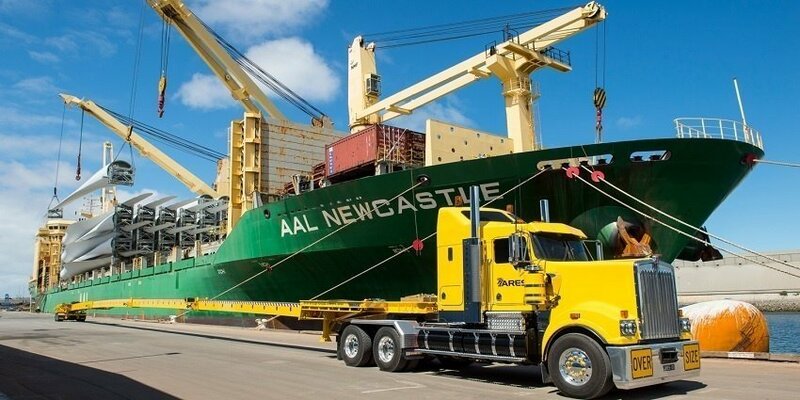 AAL’s inaugural sailing into SWP featured the AAL Newcastle – one of AAL’s owned fleet of A-Class’31,000 dwt multipurpose, heavy lift vessels- delivering project cargo. The seamless berthing and cargo discharge was a success in every regard and a milestone for our new facility, commented SWP’s President & CEO, Ted Pickell. We couldn’t be more pleased. AAL’s Pacific Service offers a monthly sailing frequency between North Asia and West Coast North America and deploys a fleet of three modern A-Class vessels, each with a combined lifting capacity of 700 mt. 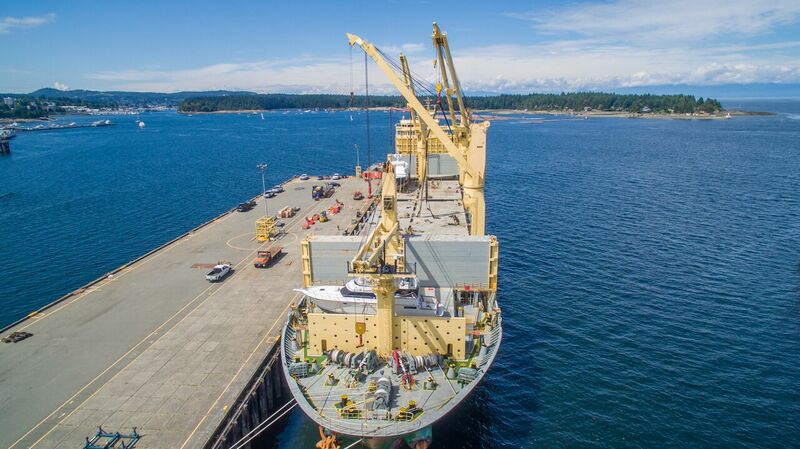 These best-in-class vessels are designed and equipped to load and accommodate outsized project cargo alongside containers and break bulk cargo like steel and pulp. Here is a short message from our Deputy Managing Director, Wolfgang Harms to all of you who attended the Breakbulk China. 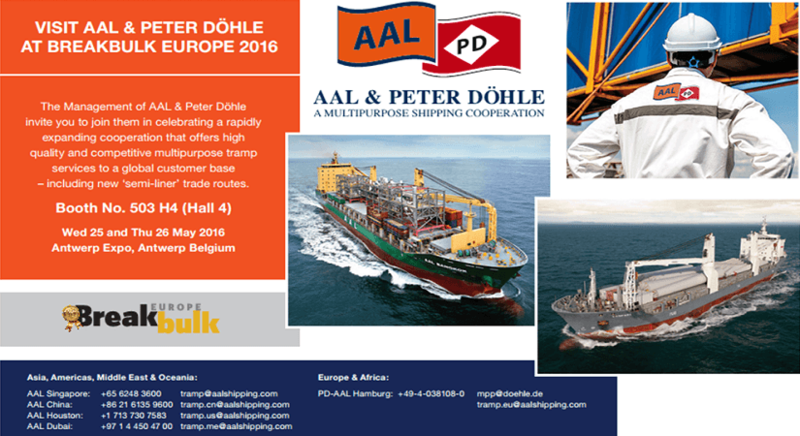 AAL will be glad to see you soon at Breakbulk Europe! AAL has had a very successful Breakbulk Exhibition last week in Shanghai. 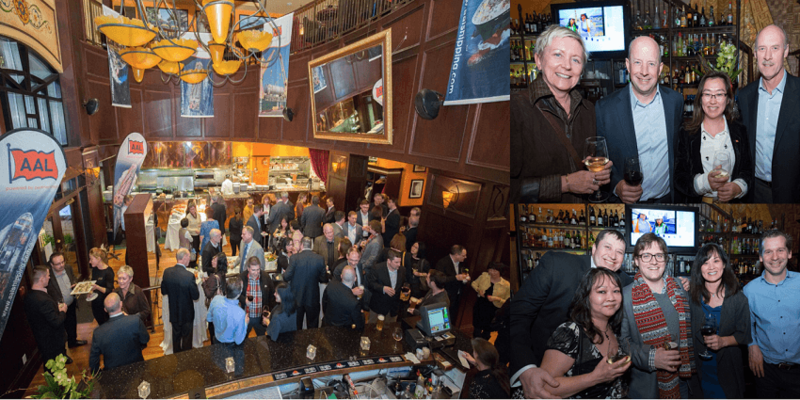 We had the opportunity to meet many new customers, see new faces and catch up with friends we have been knowing for many years. We had a fantastic attendance and everyone enjoyed the lively discussions we had with old and new to be partners. A big “thank you” to our customers and our people. AAL enjoys meeting its customers at the Breakbulk China, the largest conference and exhibition in Asia addressing the needs of traditional breakbulk and project cargo logisticians. AAL & PD have followed up their cooperation on a range of global multipurpose tramp solutions with the launch a new joint semi-liner service – ‘Asia – Middle East – Europe’. 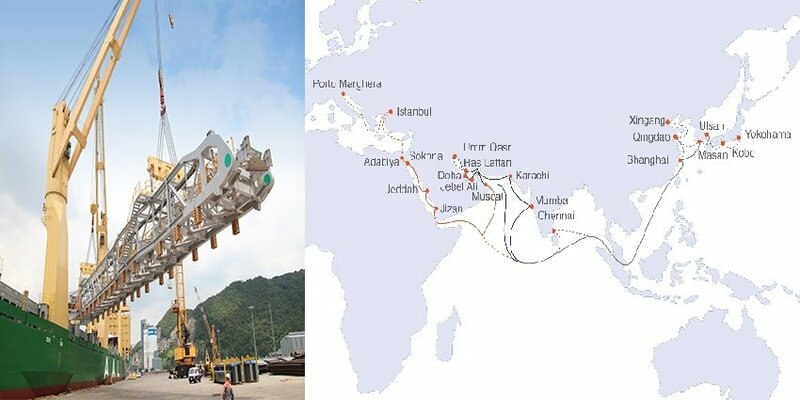 The route will connect mature and developing markets with regular fixed route sailings, flexible port calls and multiple classes of modern heavy lift MPP vessels and represents a highly competitive solution for the transport of project, breakbulk, container and dry-bulk cargo – big and small. This launch marks further expansion of AAL’s Tramp & Projects Division and a step forward in its cooperation with Peter Döhle Schiffahrts-KG (Peter Döhle). 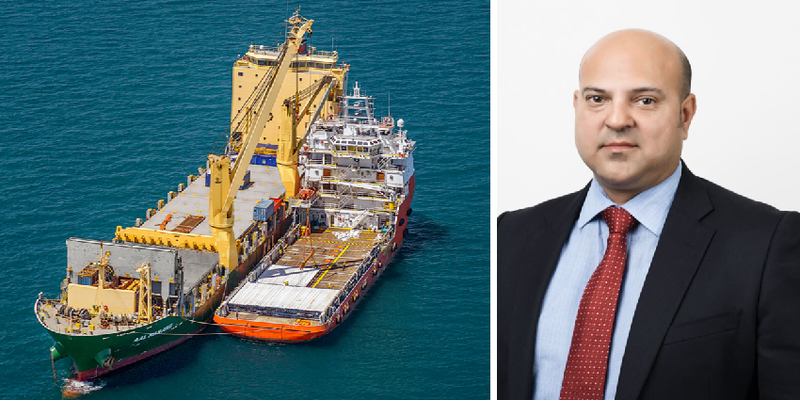 The joint semi-liner service will offer best-in-class multipurpose heavy lift tonnage and a full-service of chartering, engineering and operations. AAL’s hard work is being recognized by Jane McIvor in the the following article, published in the BC Shipping News. AAL continues to expand its service along the West Coast of North America as it adds Stewart World Port to its itinerary of ports in both Canada and the U.S.
Photo above: Presentation ceremony onboard the AAL Newcastle while at Lynnterm Terminal in Vancouver. Left to right: Lily Lv and Tanya Britton (AAL), Miles Hollingbury (Western Stevedoring), Captain Vinnyk Olesky (AAL Newcastle), Breanne Pappin (Stewart World Port) and Jean Yi (AAL). Photo credit: Dave Roels. In welcoming the AAL Newcastle – one of AAL’s ‘A-Class’ 31,000 dwt multipurpose, heavy lift vessels – Pappin noted that the first call to SWP went very well. She echoed the words of SWP President & CEO, Ted Pickell who commented that “The seamless berthing and cargo discharge was a success in every regard and a milestone for our new facility. We couldn’t be more pleased.” Pappin also credited the strong support from the community of Stewart in helping make SWP a success. AAL’s Pacific Service offers a monthly sailing frequency between North Asia and West Coast North America and deploys a fleet of three modern ‘A-Class’ vessels, each with a combined lifting capacity of 700 mt. 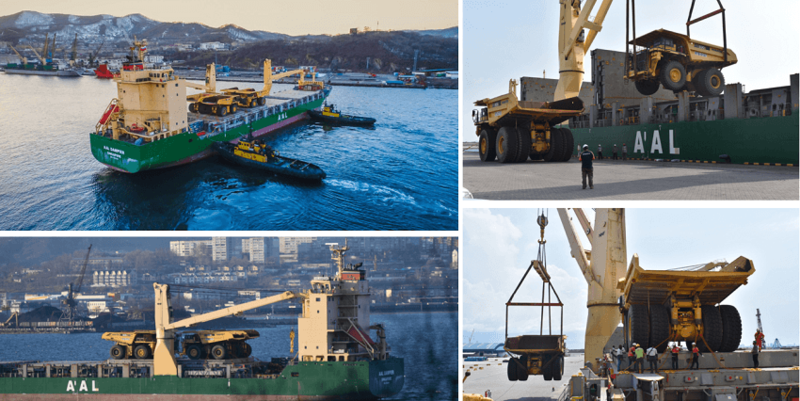 These best-in-class vessels are designed and equipped to load and accommodate outsized project cargo alongside containers and break bulk cargo like steel and pulp. For his part, Captain Olesky was very complimentary of his first experience in Stewart and looked forward to future visits. The AAL Newcastle, with a crew of 24, follows a route along the West Coast of North America – from Stewart to San Diego, Long Beach, Vancouver and Squamish – before returning to Asia. AAL will be exhibiting at the upcoming Breakbulk China in March 2015. The exhibition is being held again in Shanghai, China from 16th – 17th March 2016 at the Shanghai World Expo Exhibition & Convention Center, Hall 3. AAL will be present at booth 802. Come and visit us! For more information about the exhibition please visit our events page.